Today’s tour was a very nostalgic one as I returned to the northern city of Tzefat (also known as Safed), where I lived for three months while on my gap year in Israel. I had a great time in Tzefat where I lived with a group of friends and volunteered in the local community. To a certain extent, my return felt like I was coming home. However, as always on the guiding course, I was surprised by how many of the local sites I was completely unaware of while living here. We began our day at the Akhbara viewpoint, a lookout over the modern day Arab village which was a Jewish settlement in the 2nd temple period. We heard how Napoleon’s soldiers reached here during is 18th century campaign, in a fruitless search for the treasures of the Jewish temple in the nearby cliff face. We also gazed with awe upon the highest bridge in the middle east, over the Amud river bed, which has been engineered especially to withstand even major earthquakes (which do happen in our region). 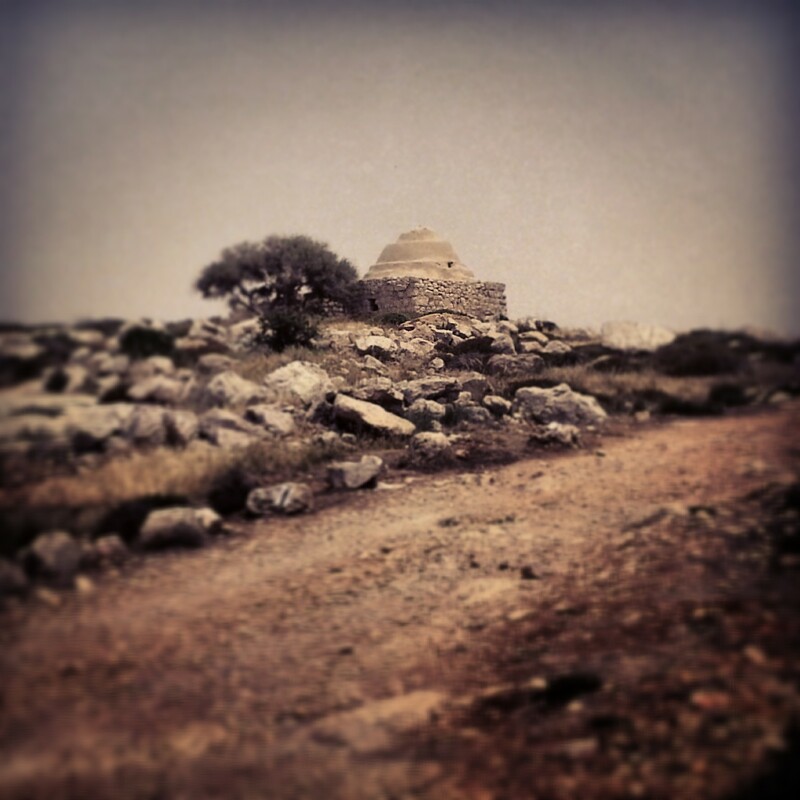 We continued up to the city of Tzefat, passing through and arriving at Mt Canaan. Here, from a vantage point over Tzefat itself, we heard the story of the city during the 1948 Arab Israeli War. It is a very dramatic tale and I shall not attempt to do it justice here; I look forward to retelling it to tourists in the future! From here we headed into the city of Tzefat itself, and after brief stops in the more modern town we entered the area of the Old City. For Jews, Tzefat is one of the four holy cities of Israel (together with Jerusalem, Hebron and Tiberias). Beginning in the 16th century, here developed many of the ideas that make up the Kabbalah, or Jewish mysticism; on the other hand (and even in contrast) it was here that the Shulchan Aruch, the definitive codification of Jewish Law, was written. 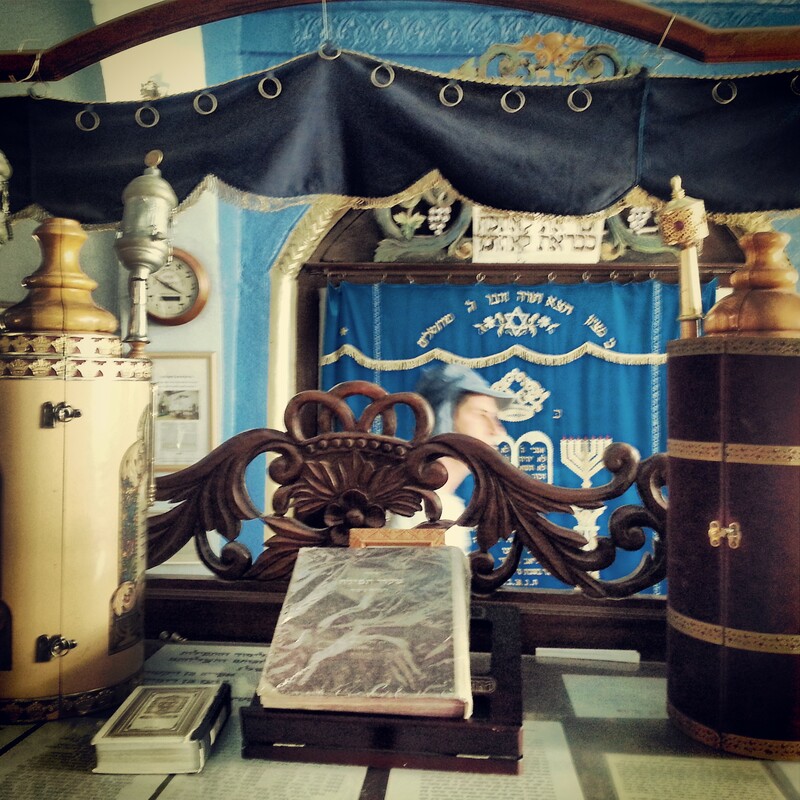 We began our visit at the Ashkenaz Synagogue of the Ari. 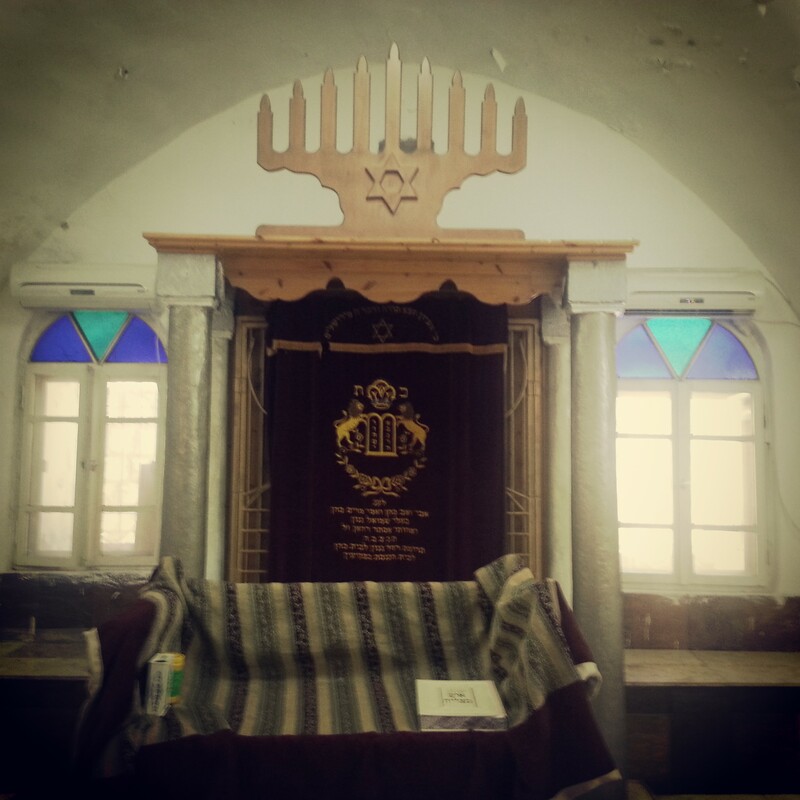 Known as a leading kabbalist (mystic) despite his brief time in Tzefat, he is credited with creating the kabbalat shabbat service which to this day is recited in synagogues around the world on Friday evenings. Tradition says that at the site of the synagogue, he would go out into the fields around Tzefat on Friday nights to welcome the Sabbath Queen, together with his followers. We learned about the history of the synagogue and some of the miracles believed to have taken place within it. Moving on, we descended into recent excavations of parts of the city covered under rubble in an 18th century earthquake. We found a 17th century mikve (ritual bath) and then descended further into a large, probably communal, structure from the 16th century. 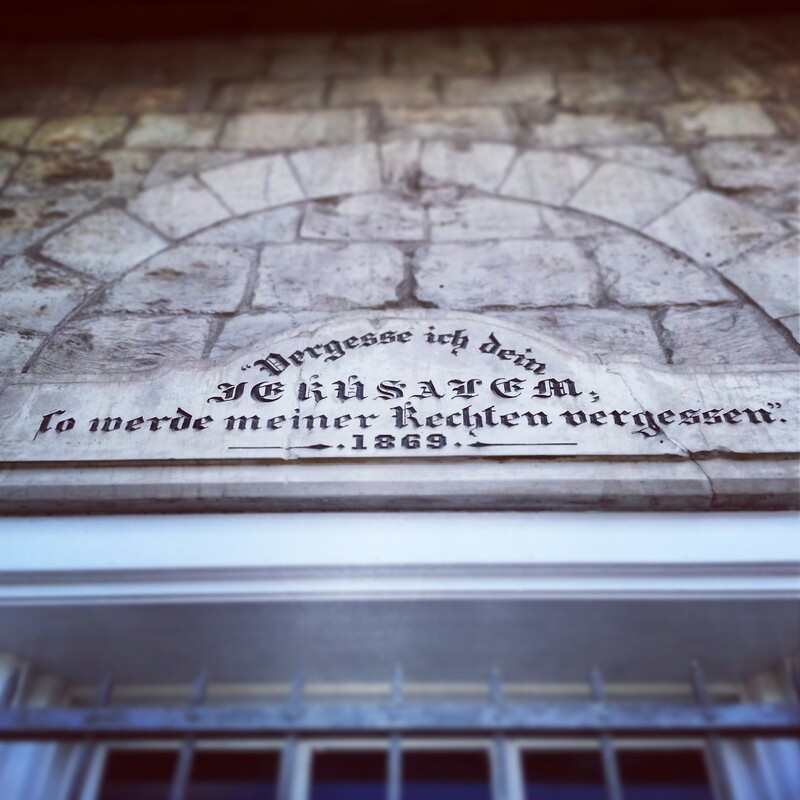 Perhaps this was frequented by some of the leading kabbalists of the time? 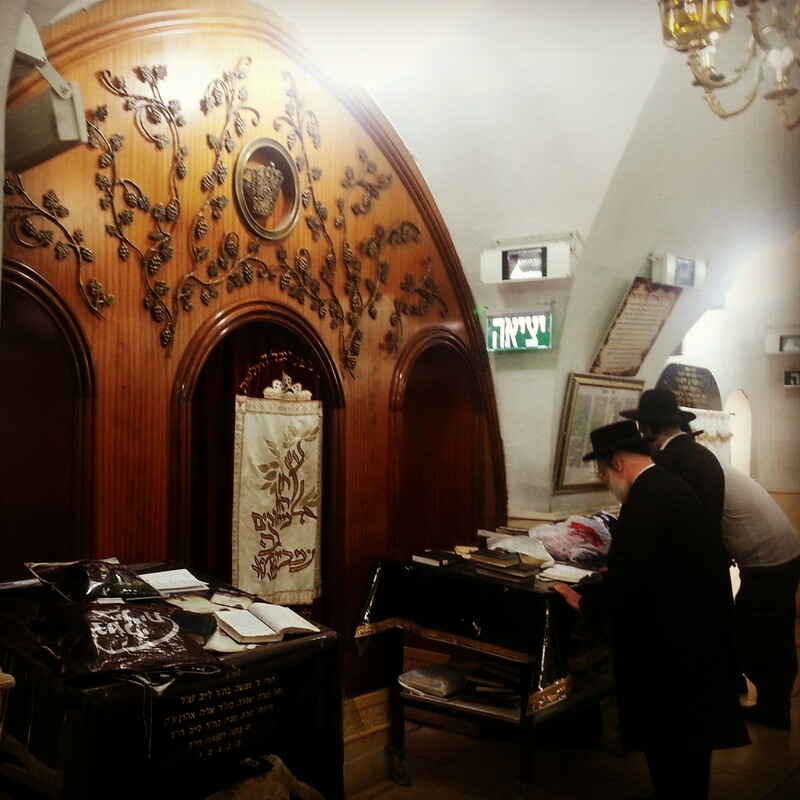 Our next stop was at the Synagogue of Rabbi Yitzchak Abuhav. 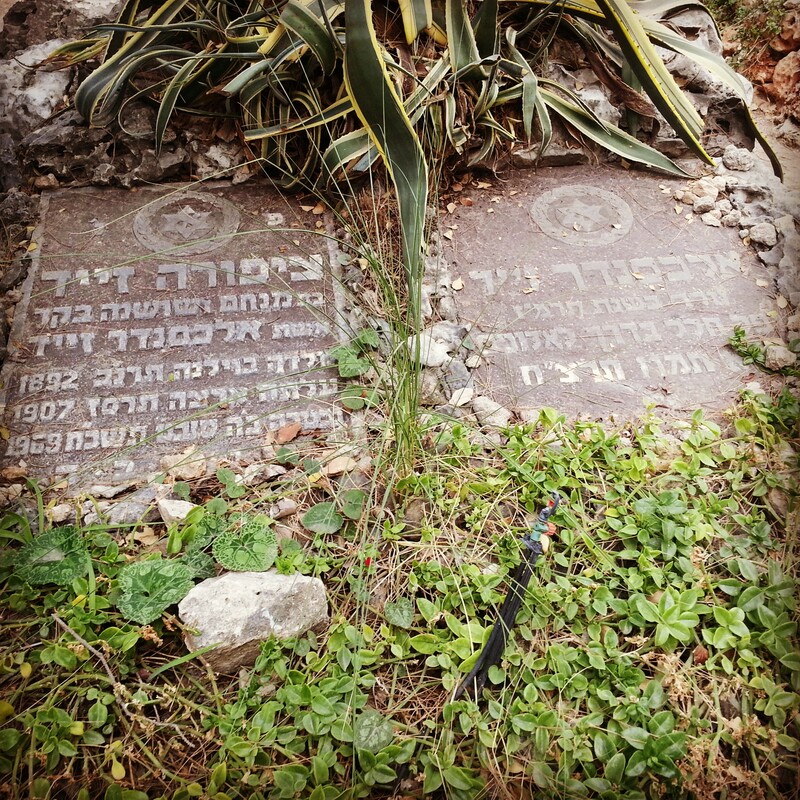 He was a leading rabbi and mystic in Spain in the 15th century, although he was never in Tzefat in person. 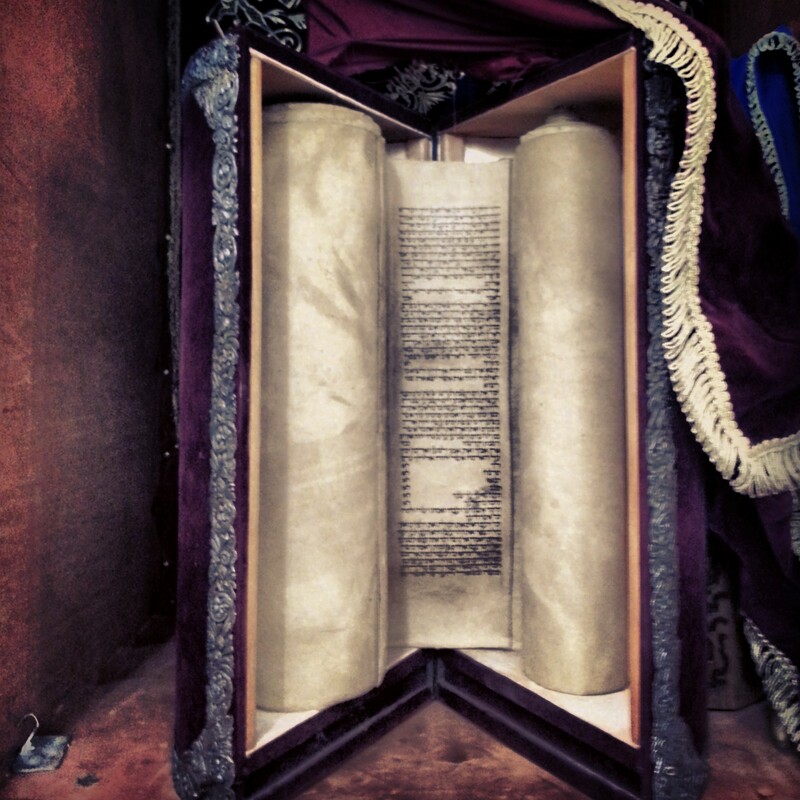 In one of the arks in the synagogue is a torah scroll written by Rabbi Abuhav, who dipped himself in a mikve 26 times each time he had to write the name of God. It is considered so special that it is only used three times a year. 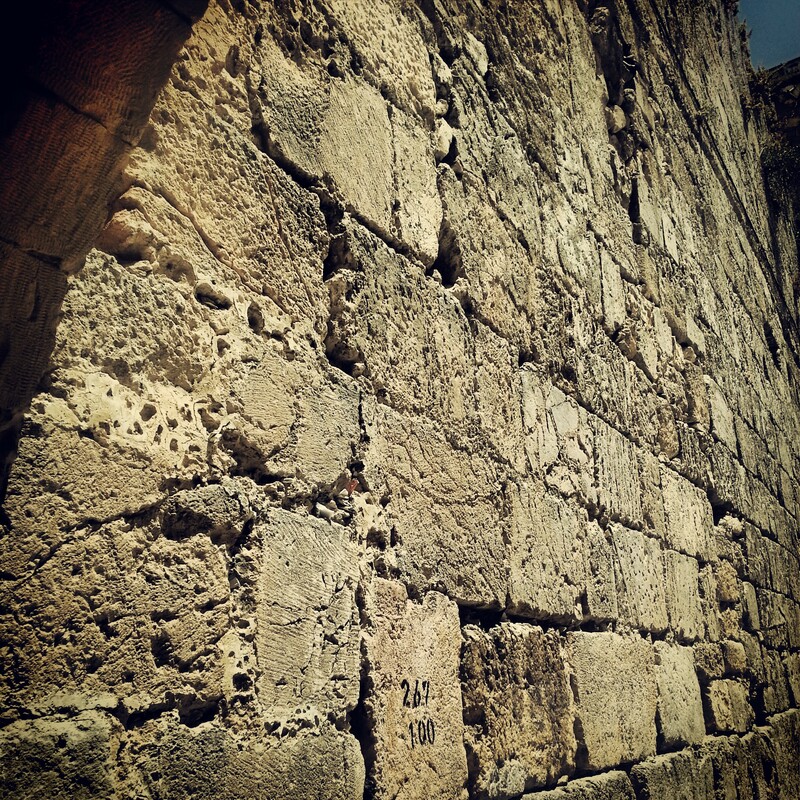 As we continued through the alleyways of the Old City, our guide entertained us with a myriad of stories about various miracles that have happened in Tzefat over the centuries. Eventually we reached our final synagogue for the day, that of Rabbi Josef Caro, the great scholar who wrote the Shulchan Aruch. After a brief look-out over the Tzefat cemetery (which contains the tombs of many of these famous rabbis), we concluded our day on the peak of the hill on which Tzefat is based, dealing with an entirely different topic. Here are the ruins of what was once the largest Crusader citadel in the Middle East, constructed in the 13th century. Later, after the fortress was taken by the Mamluks in their conquest of the area, their leader, Baibars, constructed a huge tower on the site – it was possible to see its ruins and even to wander into its cistern. The citadel is now part of a park, and I’m not sure the various couples who were spread out among the area to enjoy the sunset particularly appreciated our group passing through. As interesting as the history was, I’m not sure it added to the romantic mood. I’m pleased to say that after the explanations finished, there was just time for us to also enjoy the sunset over Mount Meiron, and the tomb of Shimon Bar Yochai (the original mystic, considered author of the Zohar), before beginning our journey back to Tel Aviv. Day two of our campus begun with a predictable early start, made all the worthwhile by one of the best (if not the best) youth hostel breakfast I have ever had. A particularly impressive array of delicious cheeses on offer! Today was dedicated to the Central Upper Galilee and we begun our tour with a walk around Pekiin, the Druze village in which we were staying. 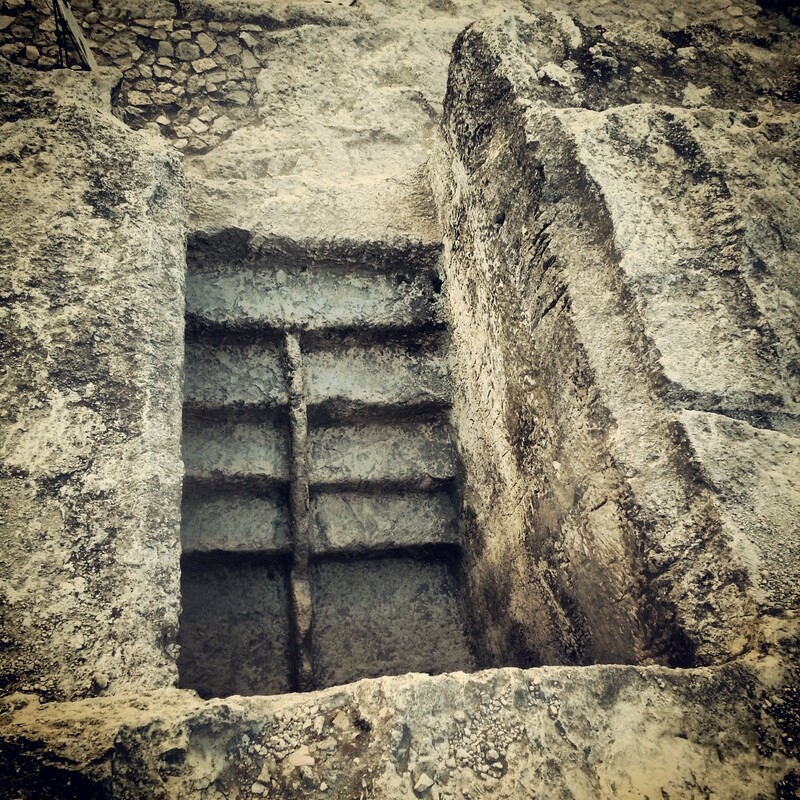 Beginning with a look out near the top of the ridge on which the village is built, we descended to the cave which tradition says hosted Rabbi Shimon Bar Yochai (the Rashbi) when he was hiding from the Romans, a story which is related in the Talmud. Here, it is said, he wrote the Zohar, one of the main books of the Kabbalah, the Jewish mystic tradition. We continued down the slope to the main town square, and then to the small synagogue. 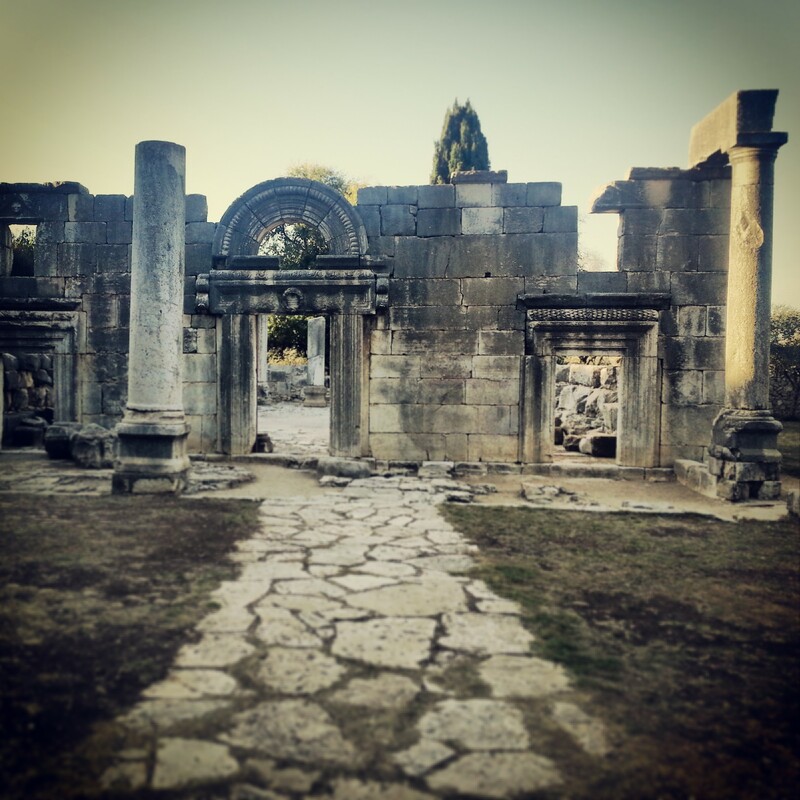 The Jewish community of Pekiin has been there since at least the 16th century (and according to local legend, since the destruction of the Second Temple) but fled during the Independence War. Afterwards, one family returned, and their daughter is now the last Jew in the village. The small synagogue is cute, and there is also a small visitors’ centre depicting life in the village in the 19th century. We continued on the Druze theme, heading east to their second most holy site in Israel, Nebi Sabalan. 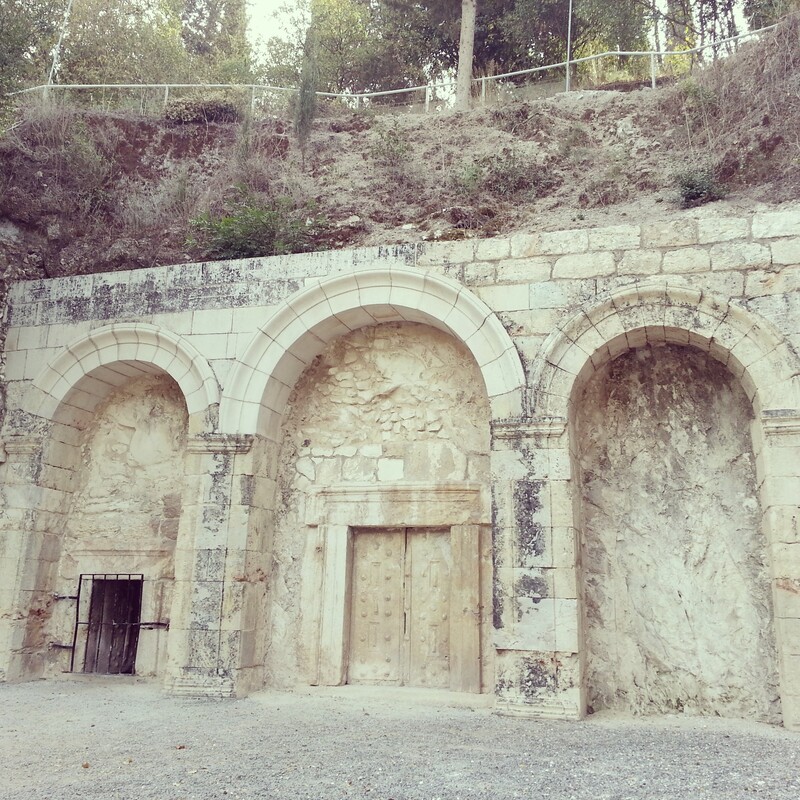 He was one of the early emissaries of the Druze faith and this is considered to be the site in which he lived. Our guide also used our visit to the site as an opportunity to tell us about the history of the Druze faith while we enjoyed the spectacular view over the rolling hills. Further east we continued, reaching the highest peak in the Galilee, and the second highest peak in all of Israel: Mt Meron. We enjoyed a short hike around its summit (reaching the summit is not recommended – it houses a military intelligence base) where there are wonderful views; we also learned about the local botany which is slightly different at this height to some of the other regions of Israel. 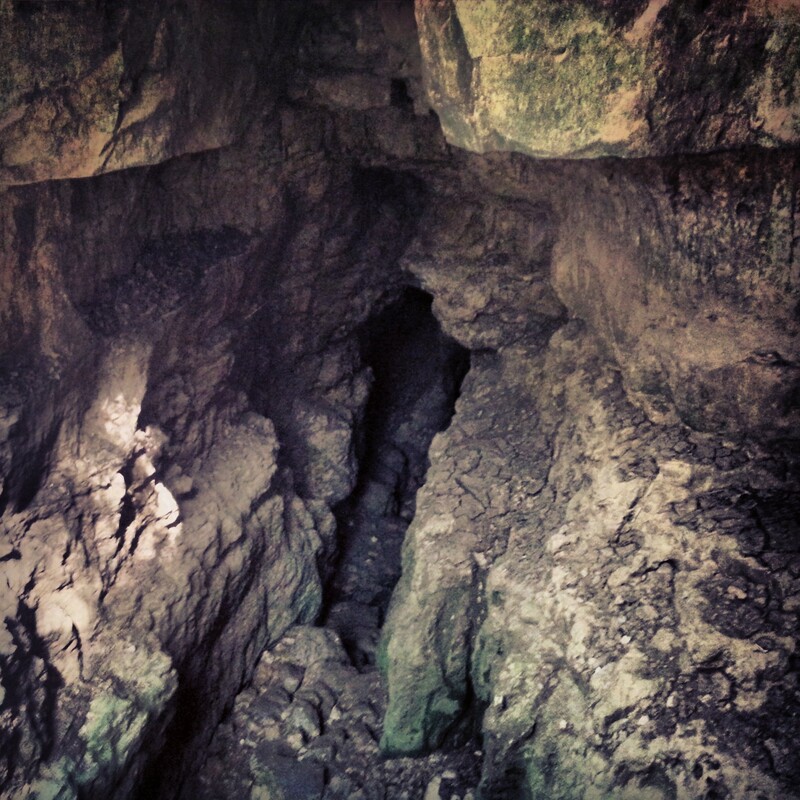 From Meron, we descended into the nearby Paar Cave Reserve. 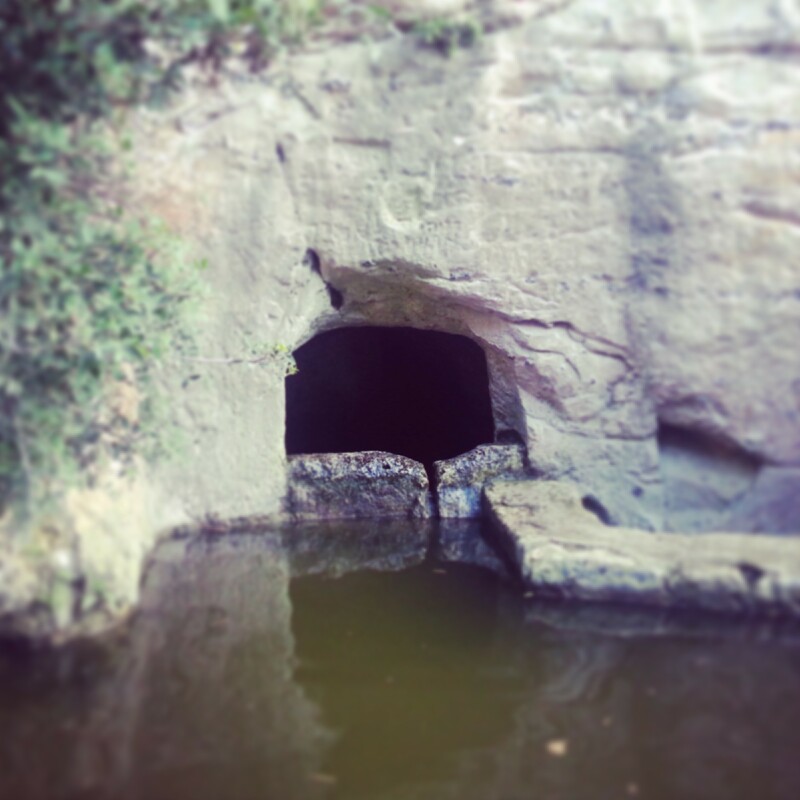 It was time for a geological interlude as we learned about the karst processes that built the valley and then formed this cave as an escape for the draining water. The valley was dry but our guide assured us that after rains it is an impressive sight to see the water powering into this small opening. There was of course an appropriate local legend to accompany the geology! 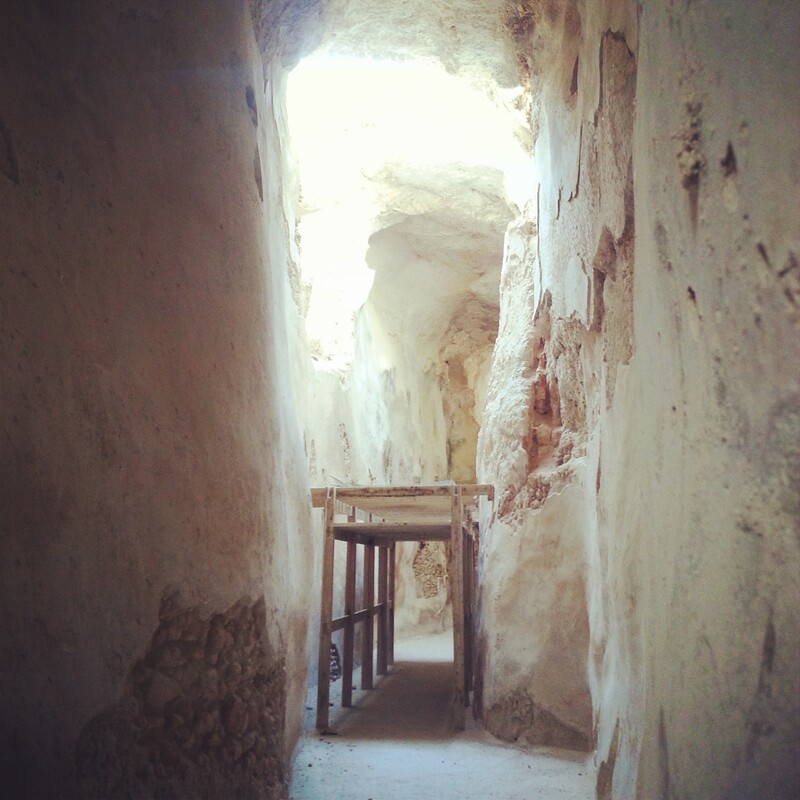 Following this brief interlude, we ascended to Meron again, from the other side, into the small moshav named for the mountain which houses the tomb of the Rashbi (whose cave we had seen earlier). The tomb is considered a very important holy site in Israel, and it is particularly fun to visit on the festival of Lag BaOmer when thousands of people make a pilgrimage here; there is general accompanying chaos and when I came here several years ago there was even a chassidic trance party off to the side. From the tomb, we travelled further north to the small village of Rehaniya, home to a large amount of Israel’s Circassian minority. They have a small visitors’ centre were we received a highly entertaining presentation from our Circassian host explaining his culture and the history of the Circassians in Israel, since they came here under the Ottoman Empire. They have a good relationship with the state and in fact their sons all serve in the Israeli army. Our final stop of the day was at the Baram Synagogue. 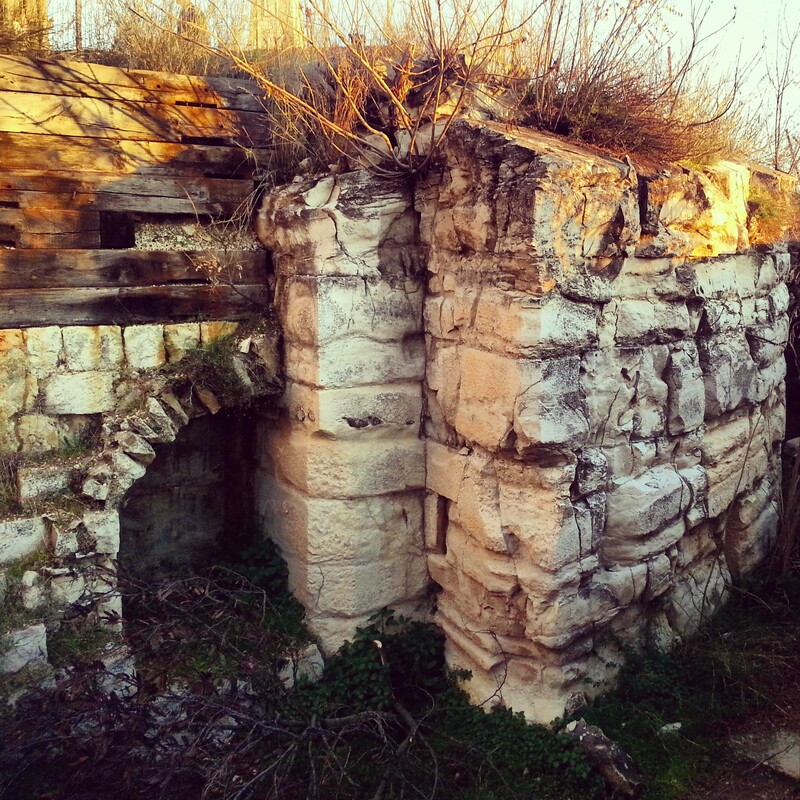 Tinged with controversy, this was the site of an Arab village (Biram) until 1948. The Arabs were advised to leave for a few weeks to protect themselves from an upcoming Israeli army operation in the Independence War, but since then have not been allowed back. The original inhabitants now are dispersed around the north of Israel and since the 50s have been petitioning the courts for the return of their land. The courts have actually approved their return pending the final sign off from the Defence Minister; successive Defence Ministers have not done this, citing security concerns. A few years ago a compromise was reached where the former inhabitants received financial compensation, but some refused to take it, still demanding their land rights. While the dispute continues, they camp in the site each summer. Amidst this is the Baram Synagogue, dating from the Byzantine period (probably in the 5th century), which was actually used as living quarters by some of the village residents. It is now an archaeological site, but our enjoyment of its former splendour was somewhat dampened by the nearby controversy. Credit to our guide who did not shy away from these issues; the role of the guide is to relate and explain, while trying to remain as impartial as possible. It is for the visitor to decide what to make of all the complexities of this country! 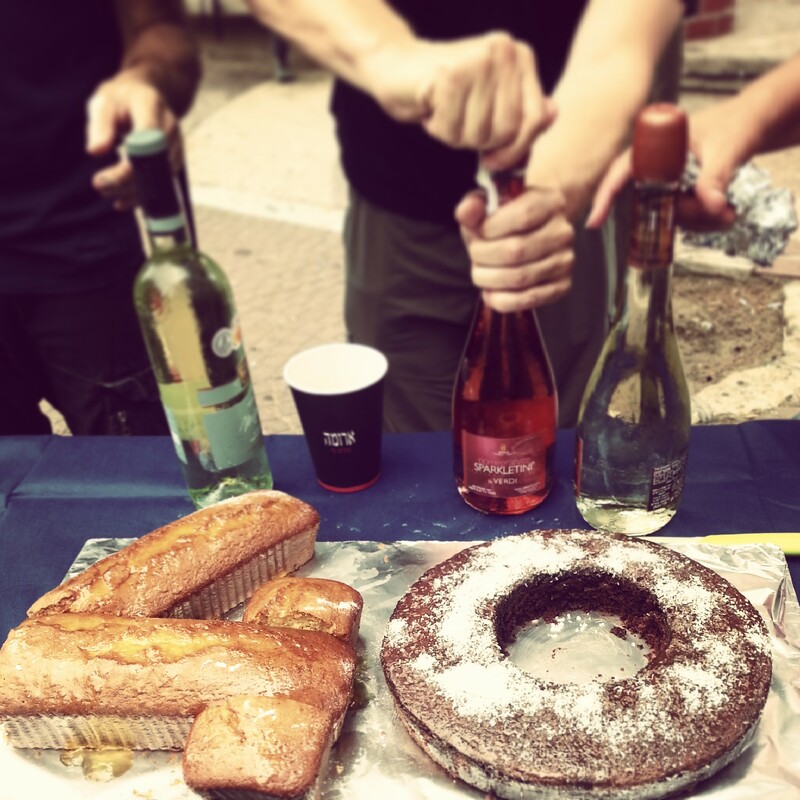 With this, our time in the Central Upper Galilee was concluded; we returned to Pekiin for a well-earned dinner! Another trip northwards, but this time to the east of the country, by the shores of the Kinneret, or the Sea of Galilee, to the city of Tiberias. This was a catch up trip with a course from the Jerusalem branch; my course sensibly visited Tiberias in February – visiting it in the last week of July when the heat and humidity are at their peak is not particularly wise, but still it is good practise for the future! Our day actually began north of Tiberias, at the Sapir Station of the national water carrier. It is an extremely secure site (Israel is worried about possible attacks on the water supply) so I’m afraid there are no pictures to show you. The visit was actually extremely interesting – water is a big issue in Israel and through the presentation we received we were able to understand how the country has historically dealt, and continues to deal, with a shortage of rain fall and natural water sources. We also learned about the construction of the national water carrier back in the 1960s, a daring and pioneering engineering project to bring water from the Kinneret to the centre and south of the country to help the farming industry. I have to be honest, I wasn’t expecting too much from the visit but was pleasantly surprised by how interesting it was (perhaps it was also because our guide there was particularly animated!). To visit, you need to be in a group, but they will let you join existing bookings if you are too few in number – contact them to arrange. It was now time to head to Tiberias, together with Jerusalem, Hebron and Safed (Tzefat), one of the four holy cities of Israel. 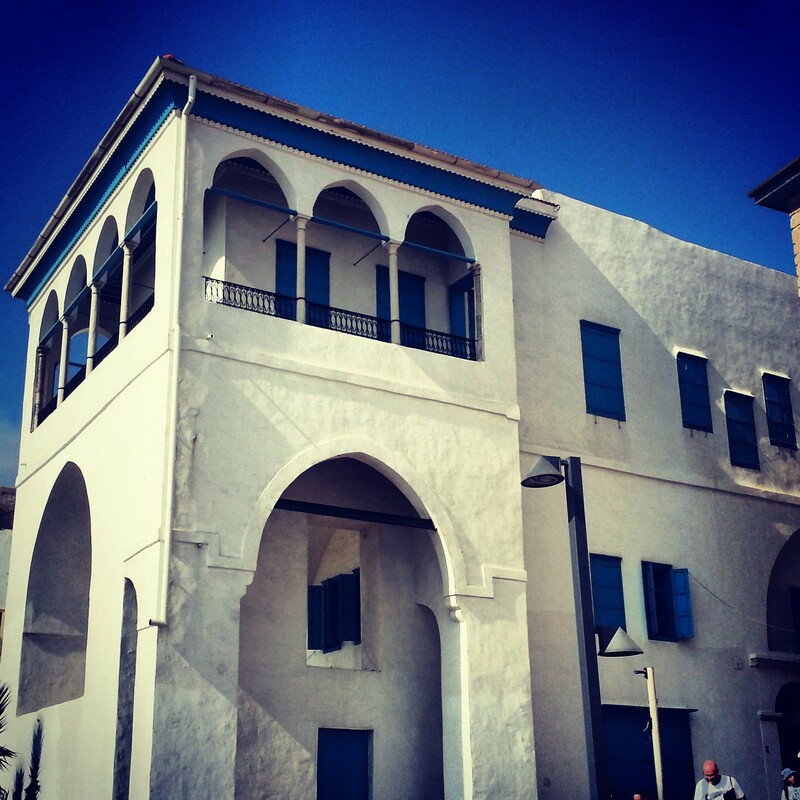 We began in the centre of the modern city, learning about its second lease of life, under the Bedouin ruler Daher el-Omar. Our guide regaled us with the story of this powerful man who gradually conquered huge chunks of Israel in the 18th century, making himself very popular with the locals but unfortunately less popular with the Ottomans. He made the deserted Tiberias his capital but eventually relocated in the face of numerous attacks from the nearby ruler of Damascus. 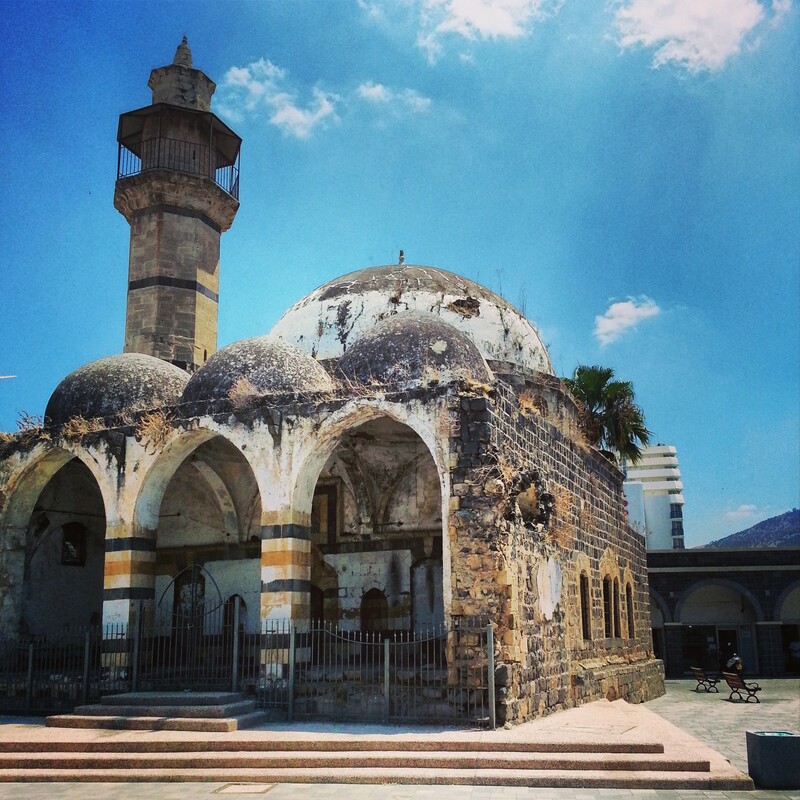 We explored some of the ruins from the Ottoman period, a fortress; government buildings, a beautiful mosque sadly in disrepair – built by Daher el Omar, this was once the main mosque of the city. We also learned about the Jewish community brought here from Turkey by Daher el-Omar under the leadership of Rabbi Haim Abulafia. Relations were good between the Jews and the Muslims during this period; the Jews of Tiberias were even able to help warn about an impending attack because of letters from Jews based in Damascus. 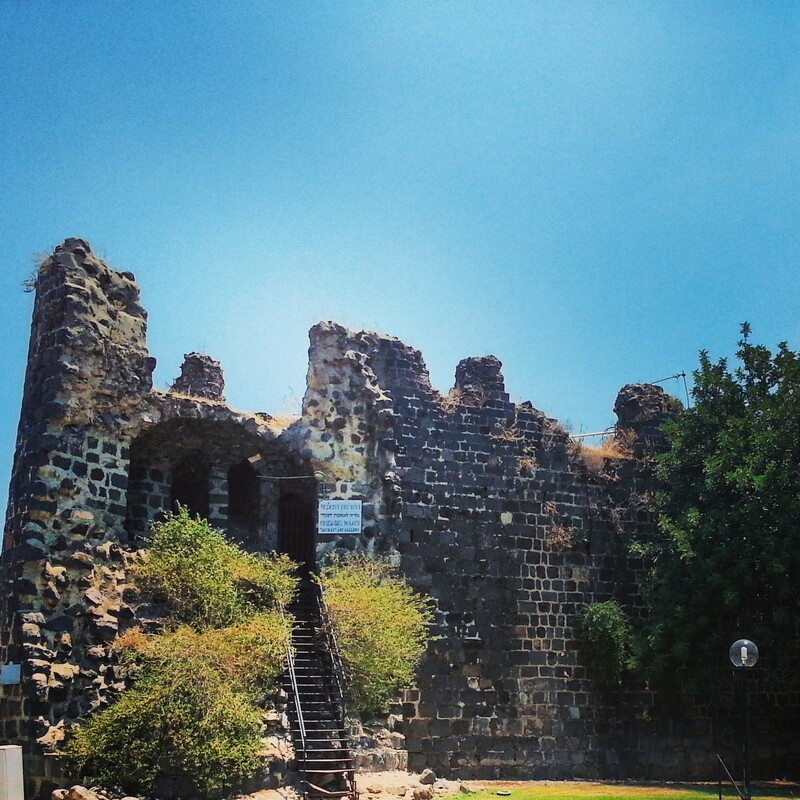 We continued south to the area of Roman & Byzantine Tiberias. This was really the city at its most grand. Most scholars agree that it was founded in the 1st century by Herod Antipas (son of Herod the Great) as his capital (he ruled the area of the Galilee). 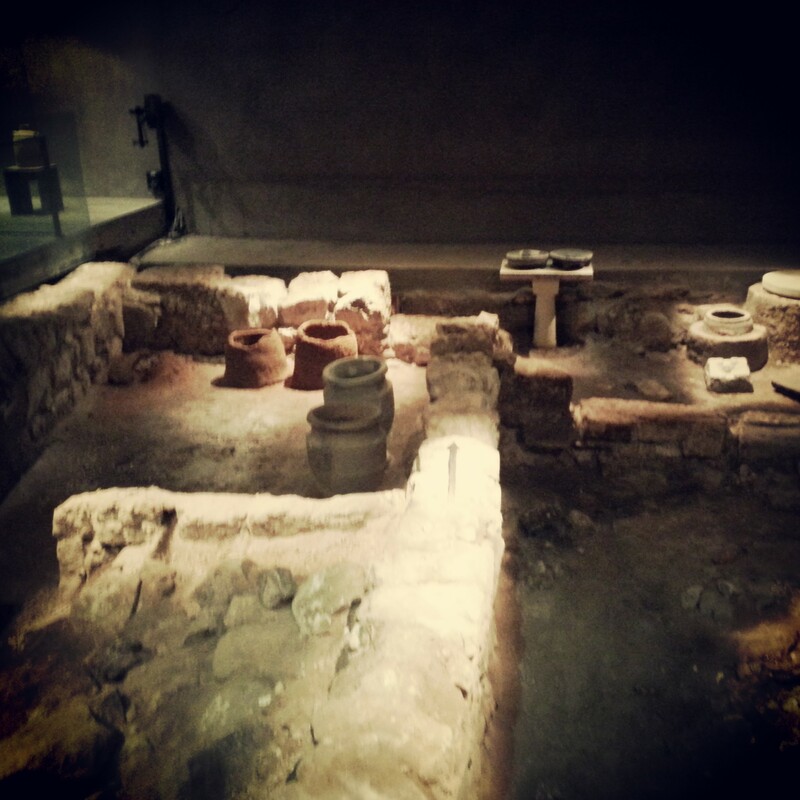 Although much has been excavated and prepared for visitors, for some reason the area of the digs is not yet open for tourists. 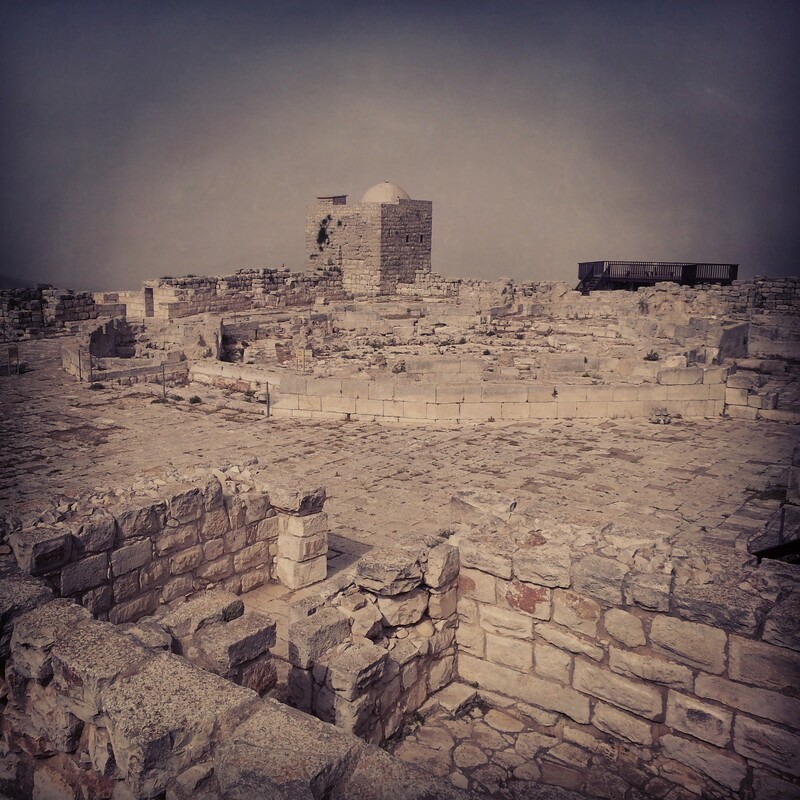 Still, as students on the tour guide course there are certain perks afforded, so the gates were opened for us to explore the city gate, the theatre and bathhouse; even the possible site of the famous Jasmin mosque built many centuries later by the Ummayid rulers of Israel. Slightly further south and we arrived at Hammat Tiberias. 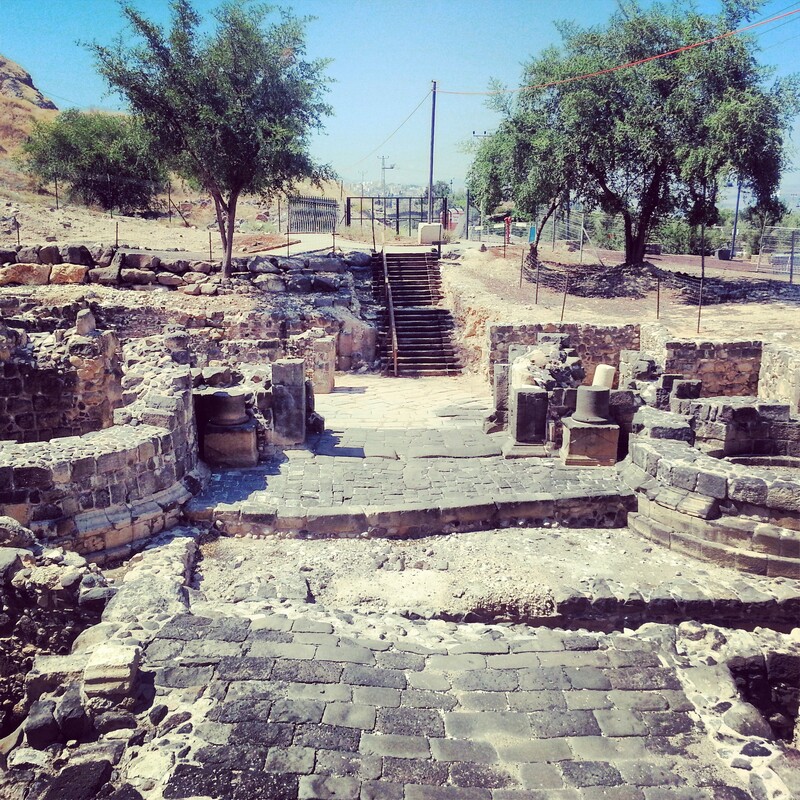 The town of Hammat is actually mentioned in the bible and after Tiberias was founded the Jews in the area continued to live there; Tiberias was built on their burial site and so was impure. Fortunately, in the 2nd century the famous mystic, Rabbi Shimon bar Yochai, passed through, and purified Tiberias (we’re not sure how). So the Jews began to move in and eventually the two towns effectively joined. At Hammat Tiberias are the hot springs which give it its name (ham is Hebrew for ‘hot’), and in the national park it is possible to cautiously dip a finger into the water (it is rather too hot for submersion!). More importantly, the site contains an ancient synagogue, or rather three ancient synagogues built on top of each other following the destruction of the previous building from earthquakes. 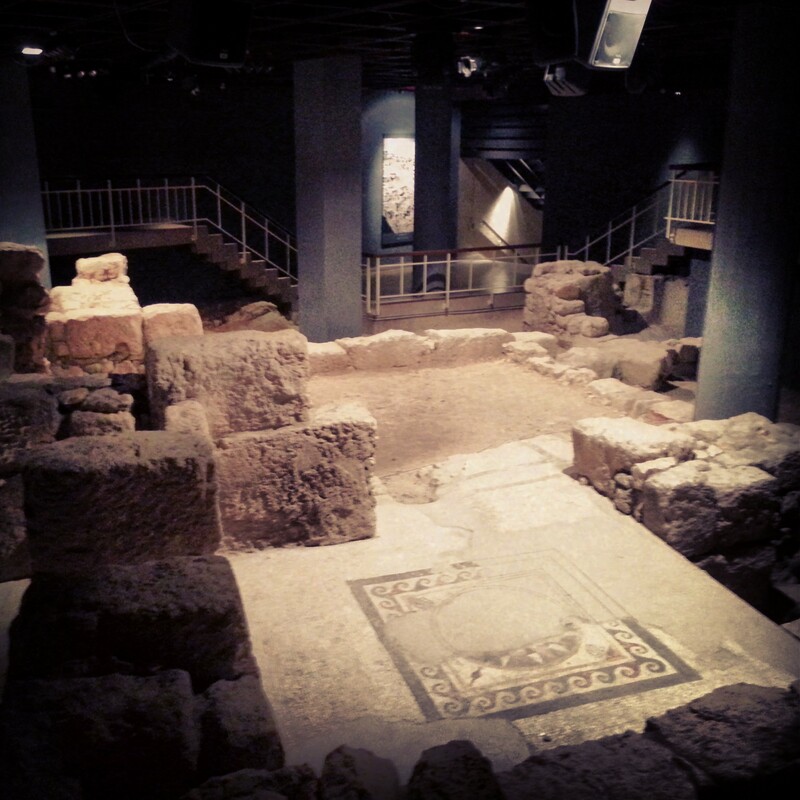 Thus, it is possible to stand in one place and see remnants of a synagogue from the 3rd, 5th and 6th centuries! 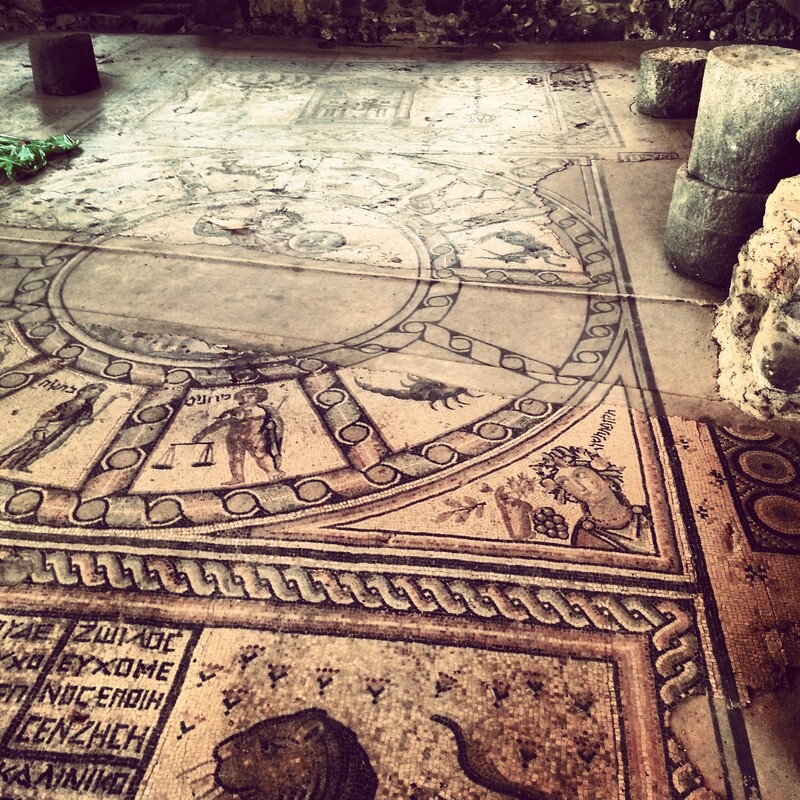 As with many synagogues from the period there are beautiful mosaics on the floor. Our guide explained the imagery and also regaled us with the tale of Tiberias as a centre of Judaism; indeed the centre of Judaism for 750 years. 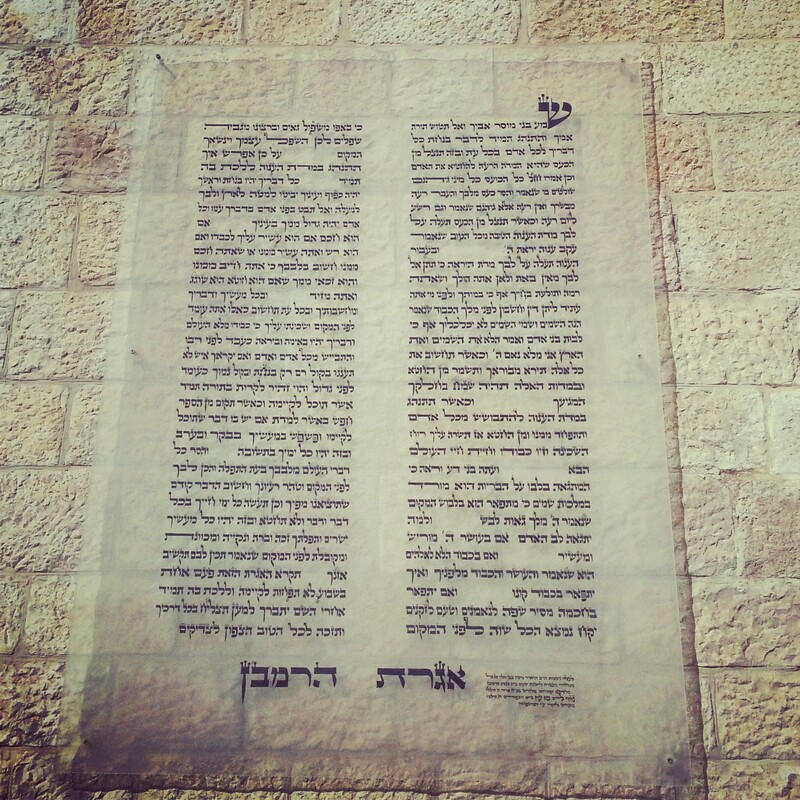 Here was written the Tosefta, the Jerusalem Talmud (confusingly); here the Masoretes finalised the punctuation and vowels of the Torah which we still use today. As we gazed into the synagogue we imagined that perhaps here came some of the great scholars whose names we still recall and whose opinions we still cite in matters of Jewish law. A remarkable thought with which to conclude the day. 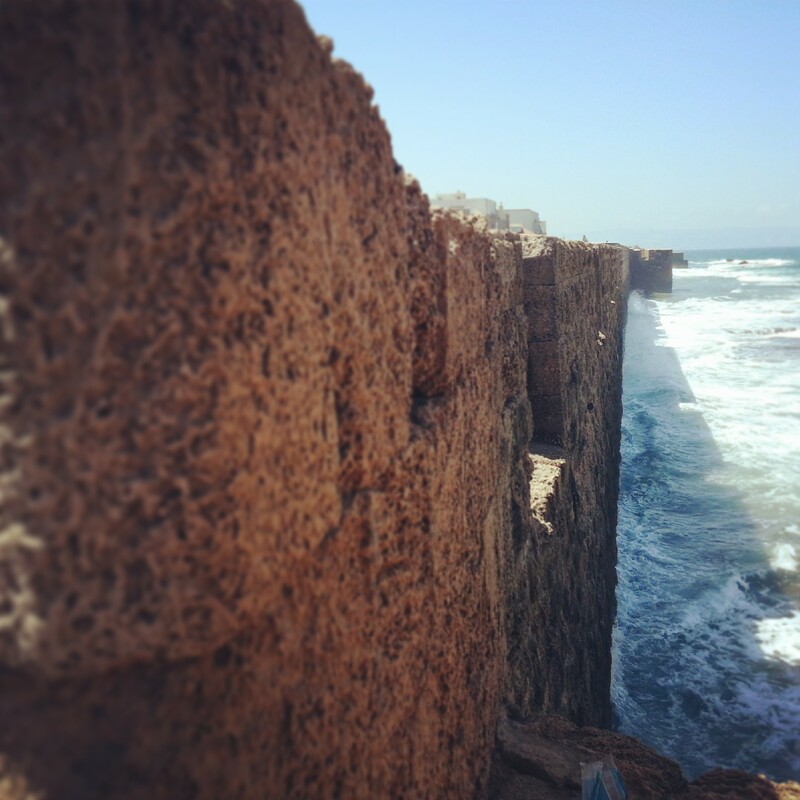 This week we were headed north again to the coastal town of Akko, or Acre. Although the area has been settled since the prehistoric period, the town really blossomed once the Romans were in charge, although little remains to testify to their presence. 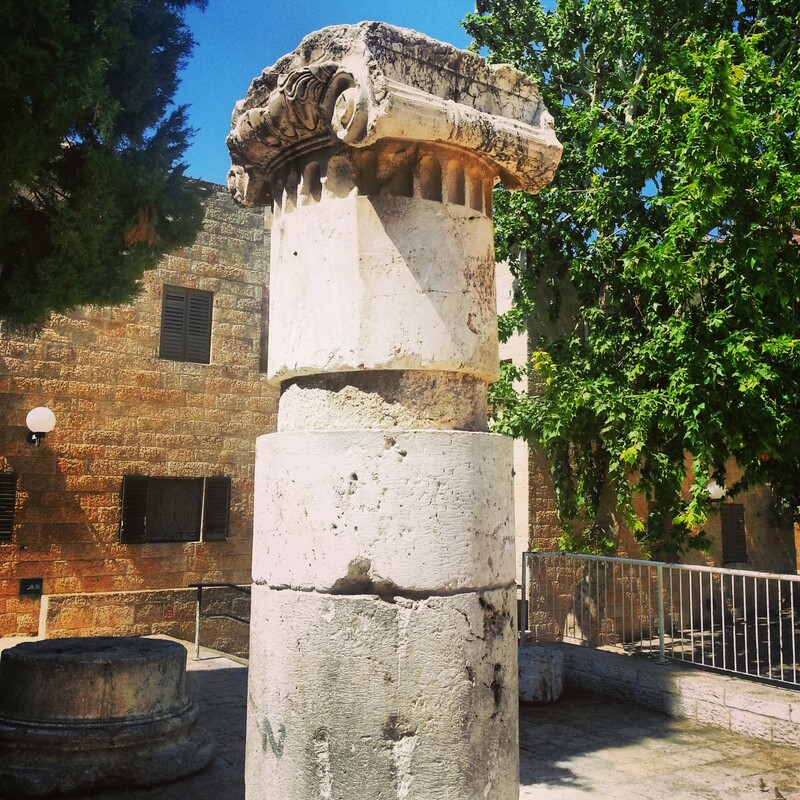 It rose again to be a city of major importance during the Crusader period, particularly during the time of the ‘Second Kingdom of Jerusalem’, when Akko was actually the capital (the Crusaders did not rule Jeruasalem at the time!). Today’s old town of Akko is largely from the Ottoman period (16th-20th century) with some excavations dating back to the Crusaders in the middle ages. We began our visit, however, reliving events from the 20th century, and the time of the British Mandate. 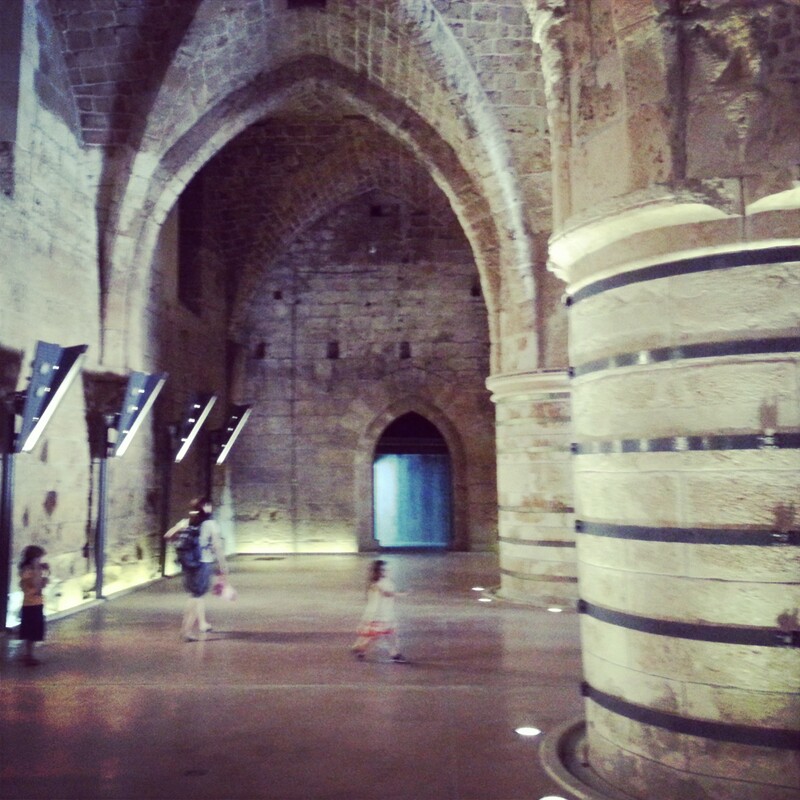 Akko was the site of a major prison, which today is the Museum of the Underground Prisoners. Among the prisoners here over the years were several important figures from the Haganah (the precursor to the IDF of today) as well as the more confrontational Etzel and Lechi splinter groups. 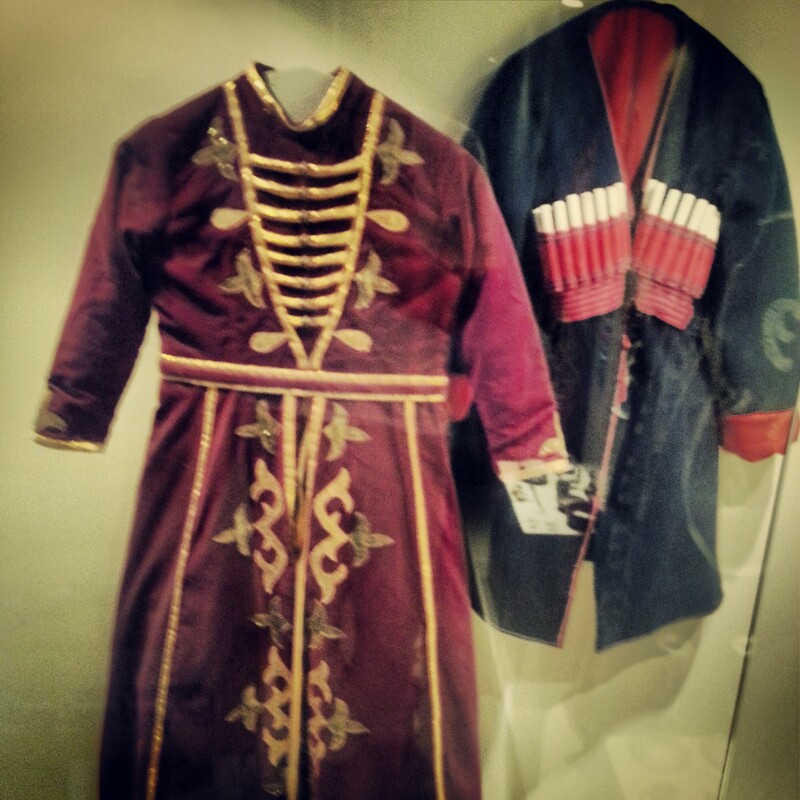 Perhaps the most famous prisoner is Zeev Jabotinsky, about whom there is a special exhibition in one of the towers. The museum sheds light on life in the prison but also, through the use of different video clips, tells the story of the break out led by the Etzel in 1947. It was very well done, I thought, and a fascinating tale for anyone interested in Zionist history. The break out made big waves at the time and was seen as embarrassing the British rulers. Whether or not it made much difference to anything is debatable; still, it’s a great story! From the museum we began a walking tour along the outer city walls (lovely views of the sea) and then into the old city itself, noting some typical Ottoman architecture en route together with the location of some Crusader ruins. Our guide explained to us that in the middle ages the city was actually divided into several walled quarters. There was a quarter for each of the rich European merchant cities of Genoa, Pisa & Venice, who had received the land in return for helping fund the Crusades. The major knights’ orders of the Templars and Hospitallers also had territory. And then some land belonged to the crown – after all it was at one point the capital! 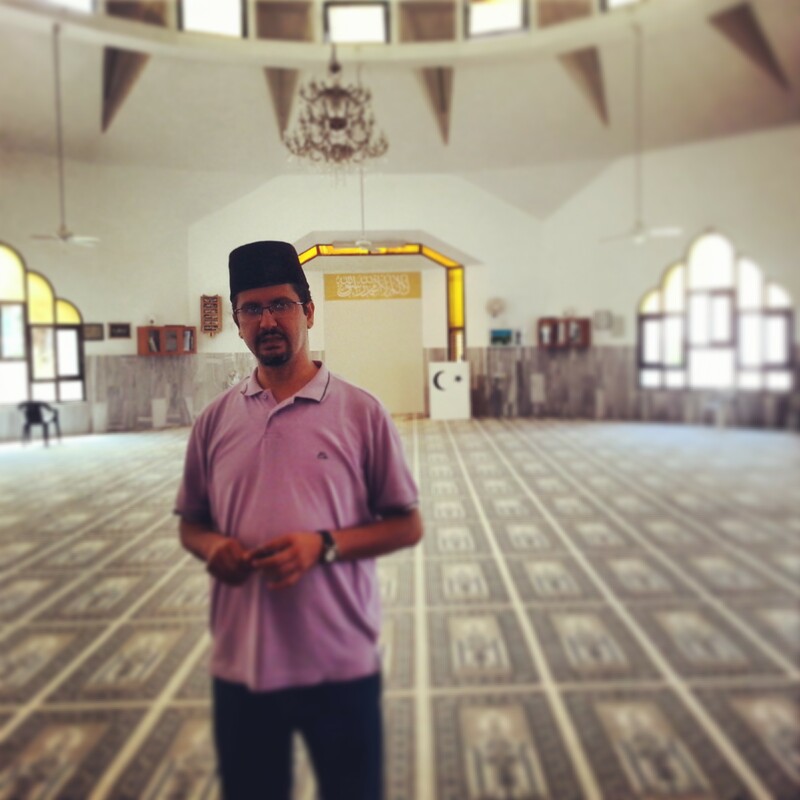 We returned to the Ottoman period with a visit to the most impressive Al-Jazzar mosque. 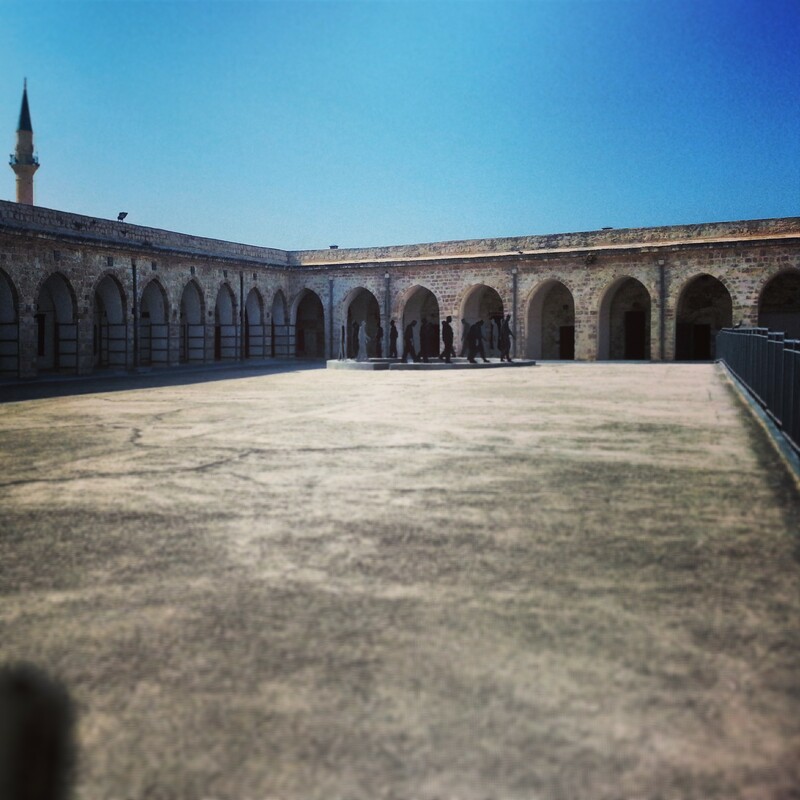 Named after the ruler of Akko who had it built in the late 18th century, it is the third biggest mosque in Israel. 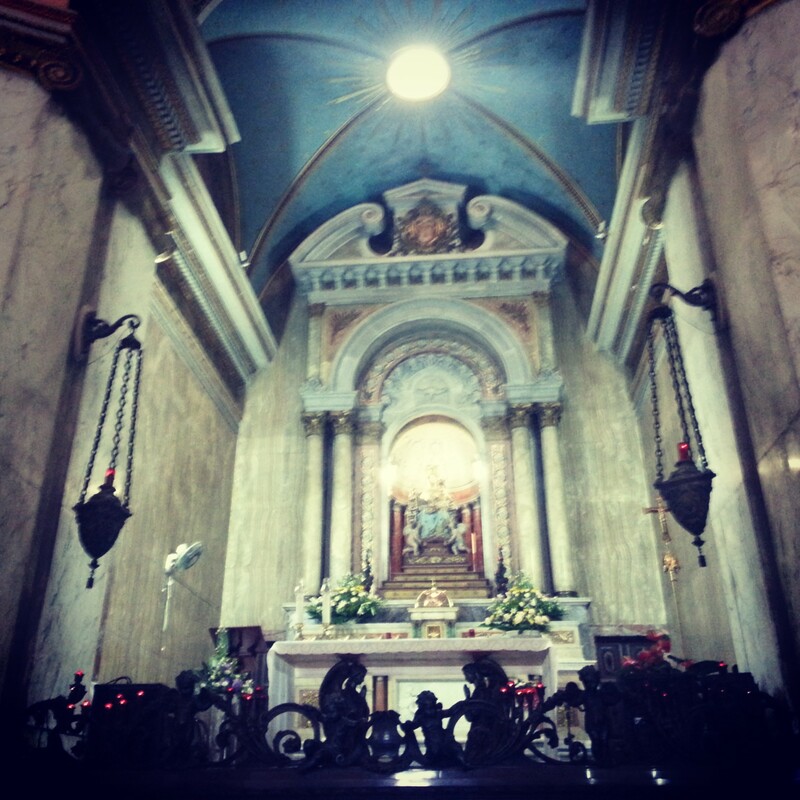 The interior is beautiful; our guide pointed out some of the architectural features. Under the mosque is a large underground reservoir which some believe helped the city withstand the siege of Napoleon in 1799; next to the mosque is the tomb of Al-Jazzar himself. 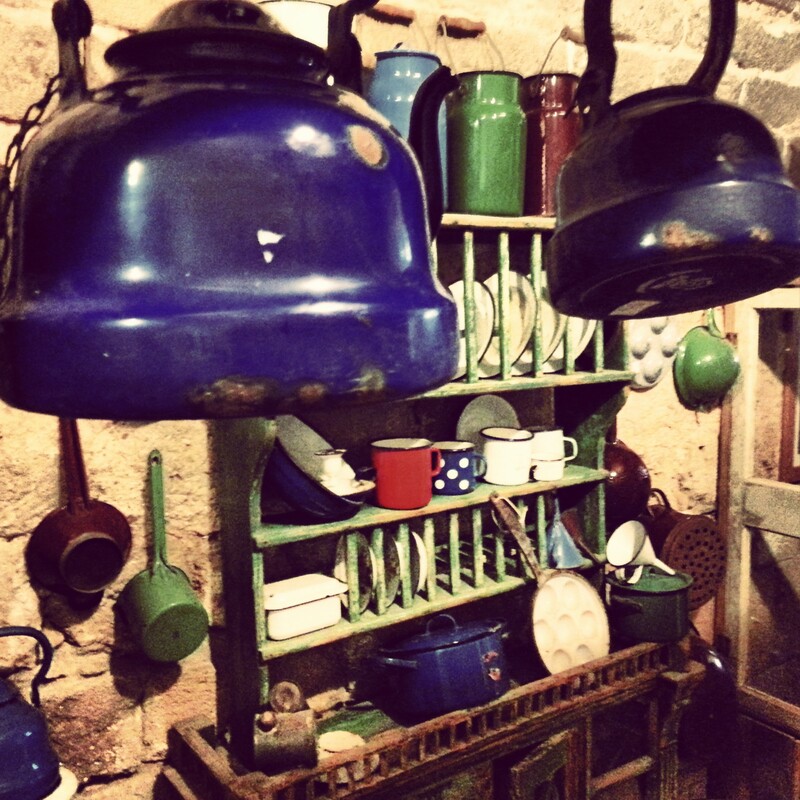 A short stroll found us at the delightfully cute ‘Treasures in the Wall’ museum. Founded and funded by two private collectors of all sorts of items (perhaps one might unkindly call some of it ‘junk’!) from the 19th and into the early 20th century, it actually is a very nice little museum; curated and laid out well. There is some beautiful old furniture from the Ottoman period and all sorts of everyday household items from the lead up to the establishment of the state which it is remarkably interesting to see. Worth the detour. 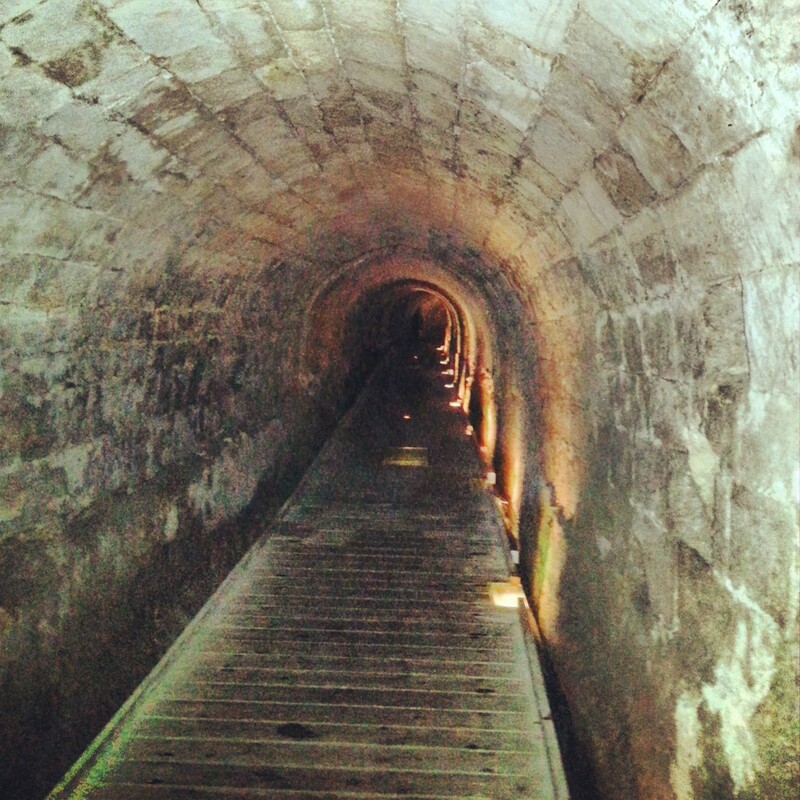 After a quick lunch courtesy of the renowned Hummus Said, we descended into the depths of the Hospitaller Fortress; the base of the Order of the Hospitaller Knights in Akko in the Crusader period. 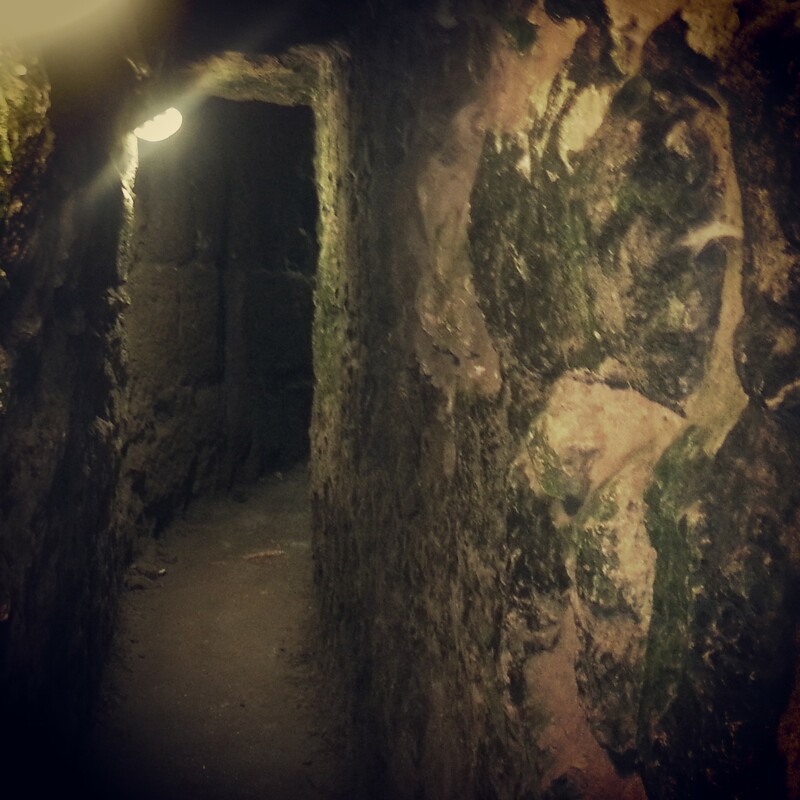 Our guide explained the theories about the use of the different rooms, as well as more about the lifestyle of these very powerful knights in the ancient city. These crusaders certainly knew how to build! On a sweltering hot day at the end of the July the last thing we had in mind was to visit a hammam (Turkish hot baths) but in the end it turned out to be a blessing in disguise – the Hammam al-Basha is no longer functioning and is in fact beautifully air-conditioned – one of the only air-conditioned moments of the day! 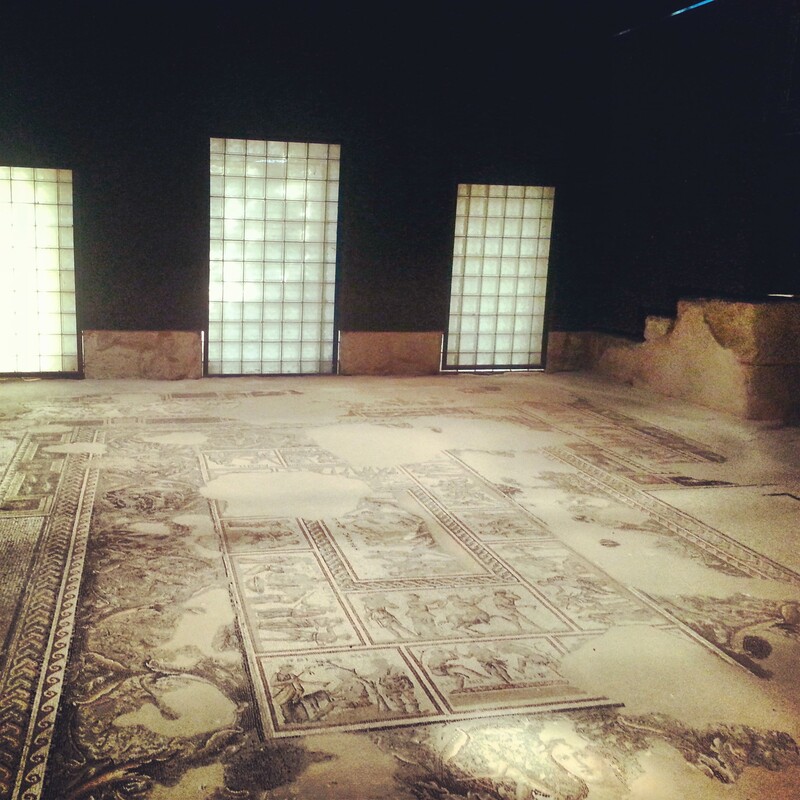 I was really impressed with this site – it has been refurbished to give an idea of what it was like originally. However, more cleverly, it uses the pretext of short films depicting conversations in the hammam to tell the story of Akko from the time it was re-established as a major city by Daher el-Omar, the powerful Bedouin ruler in the north of Israel, in the 18th century. An unexpected delight, and great for all the family. 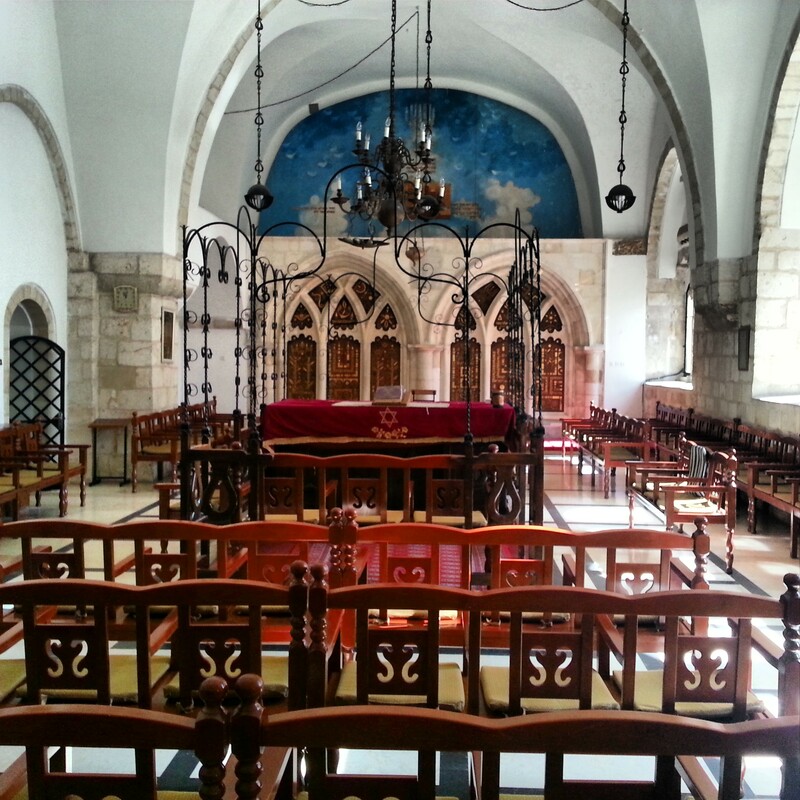 We continued on a bit of a walking tour, stopping at the Ramchal synagogue (named after Rabbi Haim Luzzato, a kabbalist and mystic who lived in Akko) and at the former home of the Bahaullah, the founder of the Bahai religion. From here our last stop in the Old City was to wander through the restored tunnel of the Templar Knights, which led from their quarter straight to the port – avoiding any potential confrontations by having to cross other quarters and potentially providing them with a handy escape route if needed. Our day was almost done but we had two stops outside the walls of the Old City before we would head home. 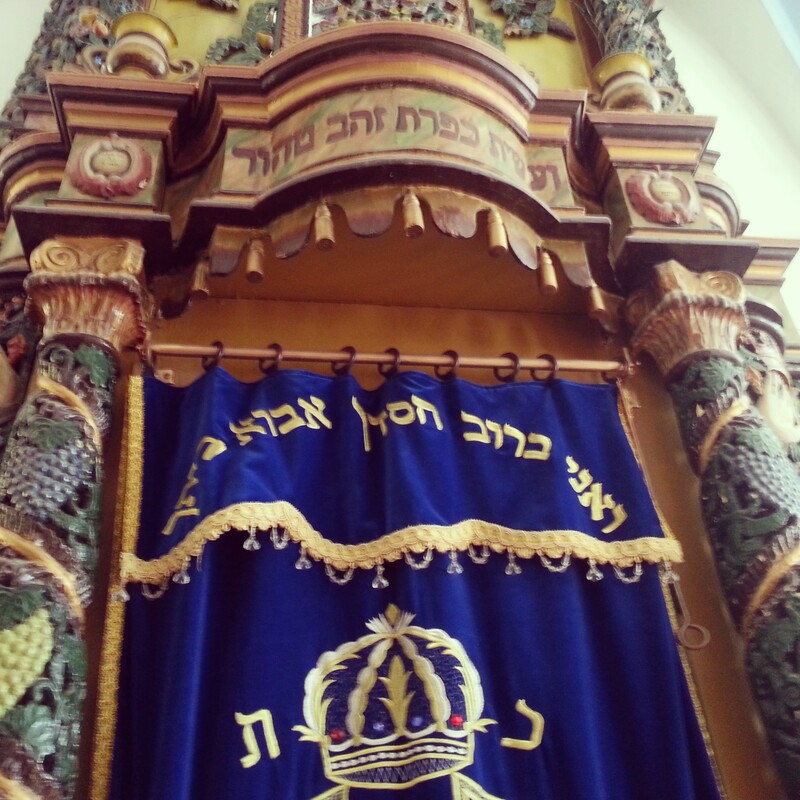 The first was at the quite amazing Or Torah Synagogue. 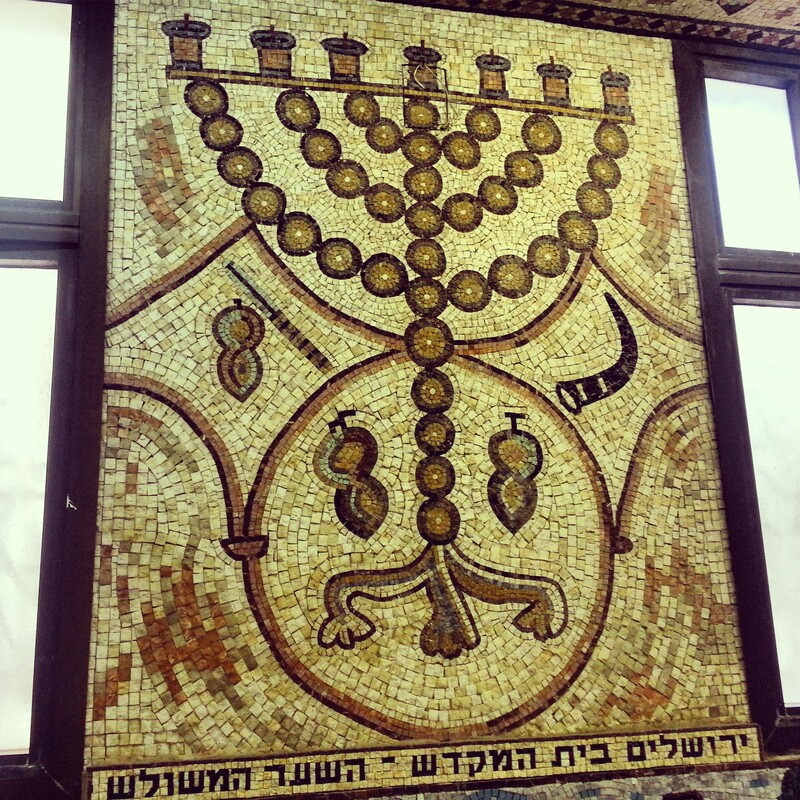 The project of one man, the synagogue’s founder and gabbai (beadle), Tzion Badash, the building is covered in stunning mosaics. And when I say covered, I mean all the floors, walls and ceilings; inside and out. It is quite astounding. Some are modern, original designs; others are replicas of ancient maps and motifs; all are connected with Judaism and Israel. It can be difficult to visit (you need to arrange in advance or arrive at the time for a service) but well worth the short diversion. To conclude our time in Akko, we made a brief stop at the Bahai Gardens known as the Bahji. 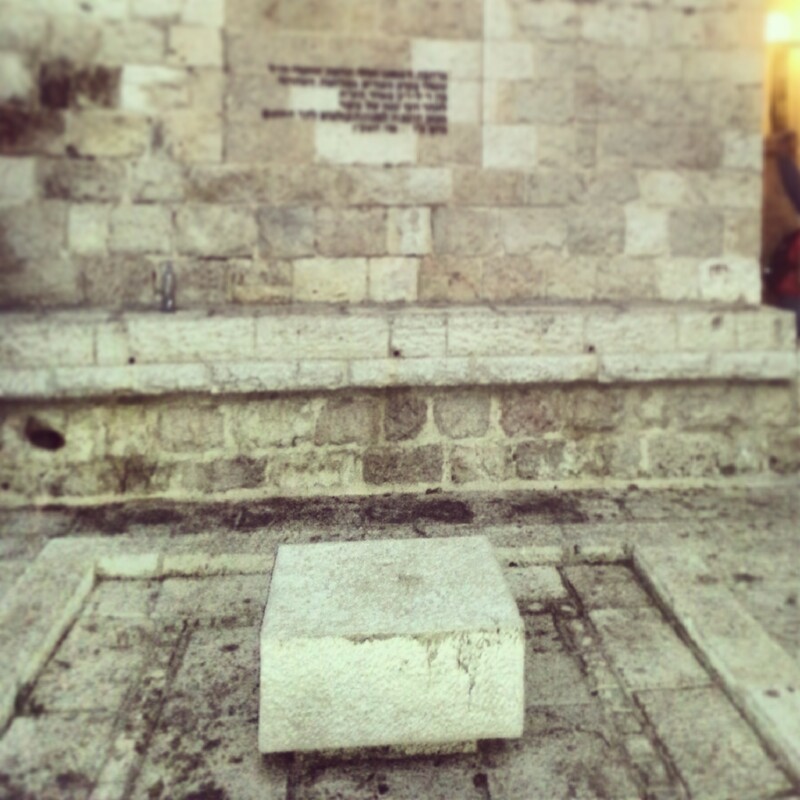 Here the Bahaullah spent the last of his days, and here is his tomb. 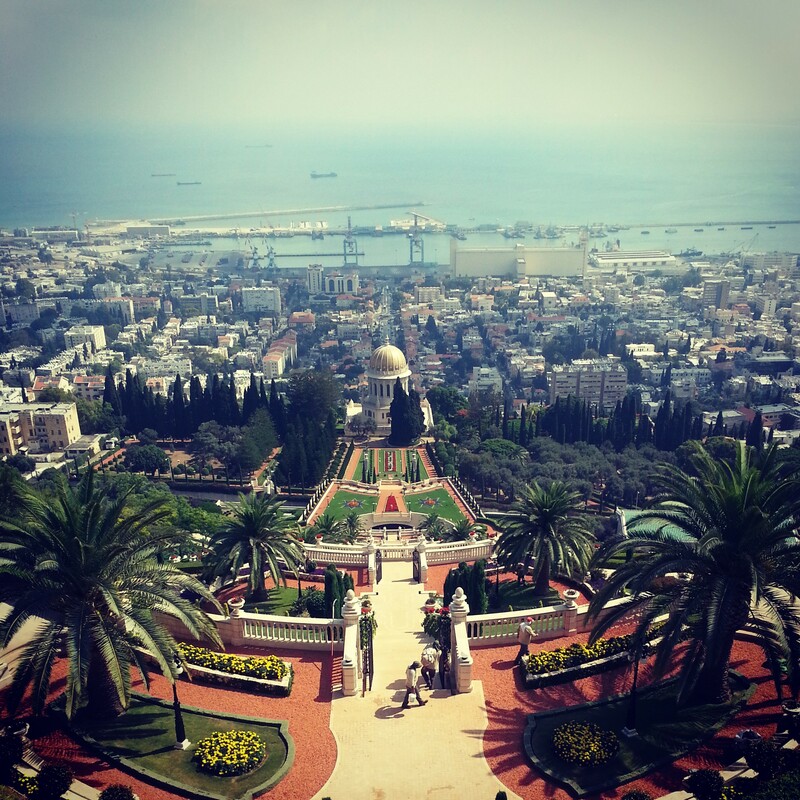 As a result, the site is actually more holy than the shrine in Haifa, although it seems it is less well known outside of the Bahai faith. As with the gardens in Haifa, it is remarkably beautiful and tranquil. We have been studying Islam in class of late and so it was time to spend some time in Jerusalem exploring some of the holy sites and the history of Muslim rule over the city. We began our day in the area commonly known as the Temple Mount, referred to by Muslims as al-Haram ash-Sharif. This plateau is considered to be the place referred to in the Qur’an as al-Aqsa, or the farthest mosque. In this famous passage Mohammed travels from Mecca to this far away place in an episode known as the Night Journey. He then tethers his horse and ascends to heaven. Although the Qur’an does not specifically mention Jerusalem in this episode, early commentaries already identify al-Aqsa as being synonymous with the city, and for this reason it is the 3rd holiest city in Islam after Mecca & Medina. 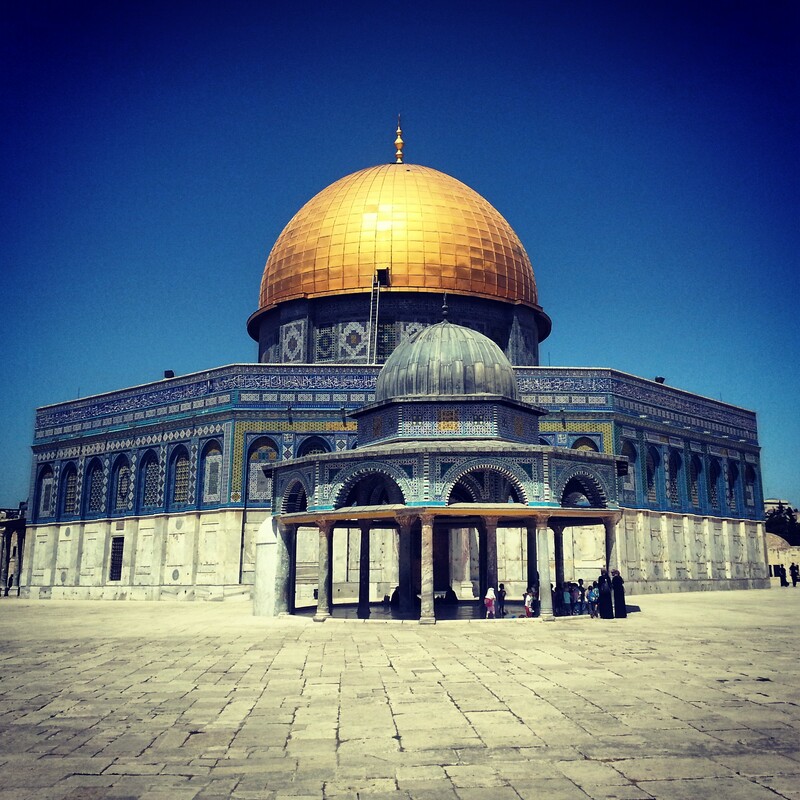 The two large mosques on the site are the grey-domed al-Aqsa, marking the site where Mohammed arrived with his horse, and the famously striking Dome of the Rock (Masjid Qubbat As-Sakhrah), with its stunning gold dome, which marks the site where Mohammed ascended to heaven. Unfortunately it is no longer possible for non-Muslims to enter the mosques, but I recall visiting the Dome of the Rock as a child on a family trip and remember seeing inside it the rock from which it takes its name. 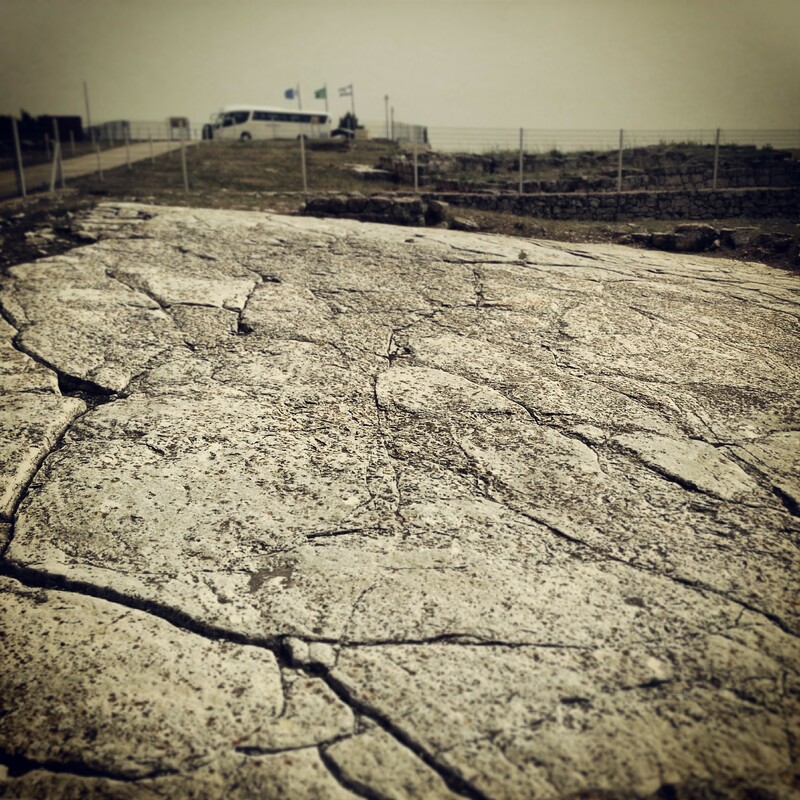 There is an indentation on the rock identified as being Mohammed’s footprint; the rock is also considered to be the site of the story of the binding of Isaac. Access to the area which I will for convenience’s sake refer to as the Temple Mount is complicated. There is one entrance for non-Muslims – the Mugrabi Gate which is just to the right of the Western Wall. There you are checked thoroughly for weapons or any Christian or Jewish prayer books/bibles – the area is very sensitive and non-Muslim prayer is forbidden. The Israeli authorities who control access to the site are very concerned to avoid any potential provocation, hence the strong controls over who can access the site; where, when and with what. Once through the security it is possible to enjoy the impressive expanse of the Herodian podium and the two remarkable mosques based upon it. 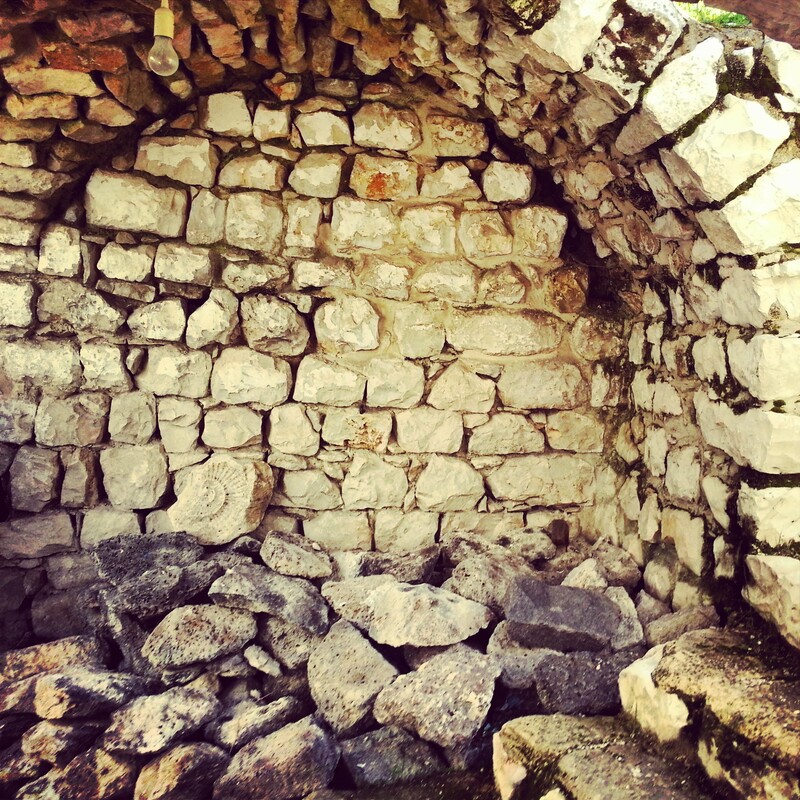 The original mosques were built in the 7th century when the original Church of the Holy Sepulchre was still standing. Our guide illustrated to us that in fact the structure was almost an exact copy of the Church – a rotunda (marking the site of the miracle); a basilica for members of the public to pray and also a garden in between. 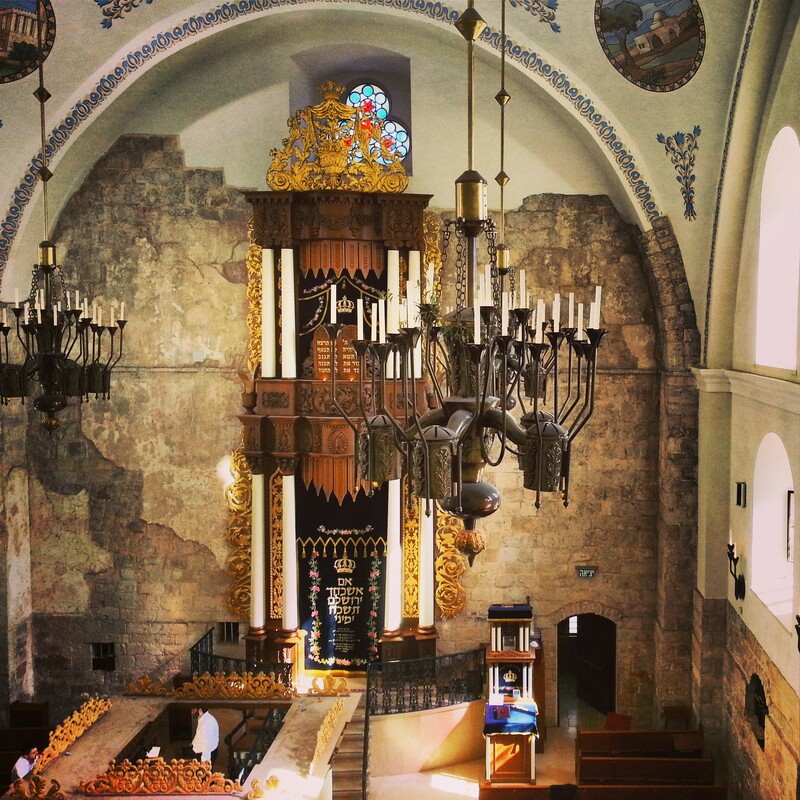 Although our focus was on the Muslim sites we took advantage of our visit to also look out for and learn about areas of the Jewish Temple and the Crusader church known as the Templum Domini. We also saw where the Templar knights were housed in this period. 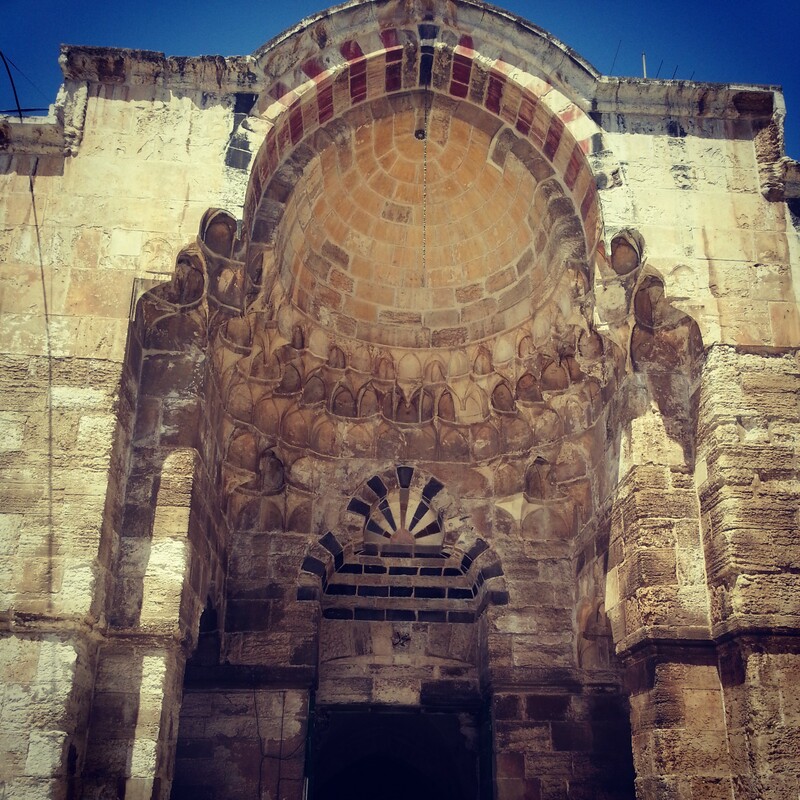 We continued around the site as our guide pointed out examples of 14th century Mamluk architecture and also the mausoleum for leaders of the Palestinian liberation movement. 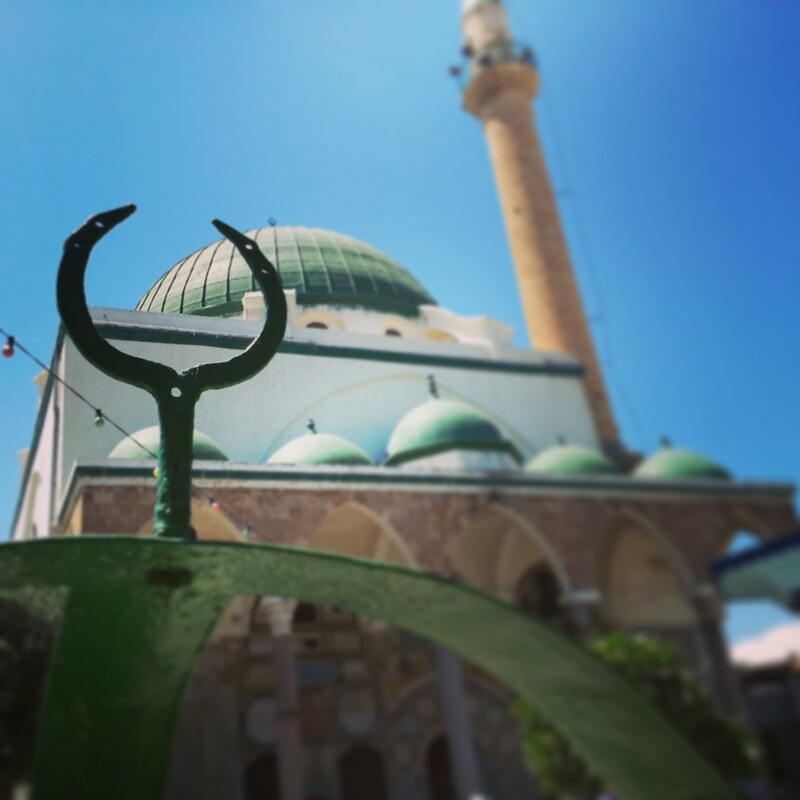 We exited the plateau and began a tour of the Muslim Quarter. As this was largely constructed by the Mamluks, we focused on further understanding their architecture and also noting the various madrasas (schools) that they constructed. Through the use of maps from different periods our guide explained to us how the streets of Jerusalem changed over the centuries and by whom the alterations were made. 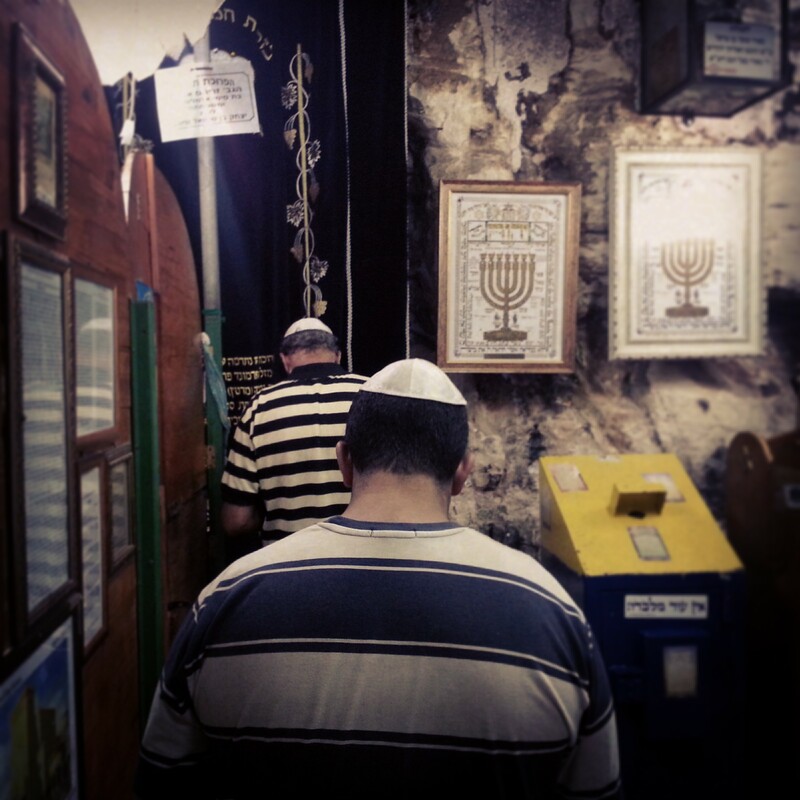 After enjoying a good bowl of hummus in the famous Abu Shukri restaurant we made a short stop at Jewish site, although one located in the Muslim quarter. 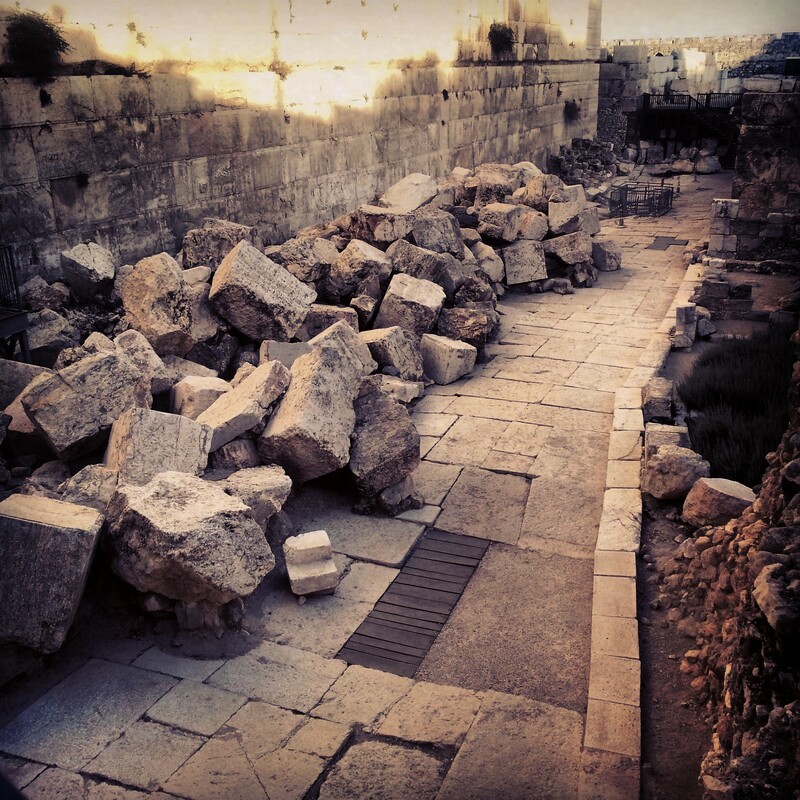 Known as the Little Western Wall, this is a continuation of the Western Wall, north of what is currently exposed in the plaza. The plaza is a relatively new phenomenon, and what is nice about his section is that it is at the height and width of the wall until the Israelis created the plaza in 1967 when they captured the old city of Jerusalem. 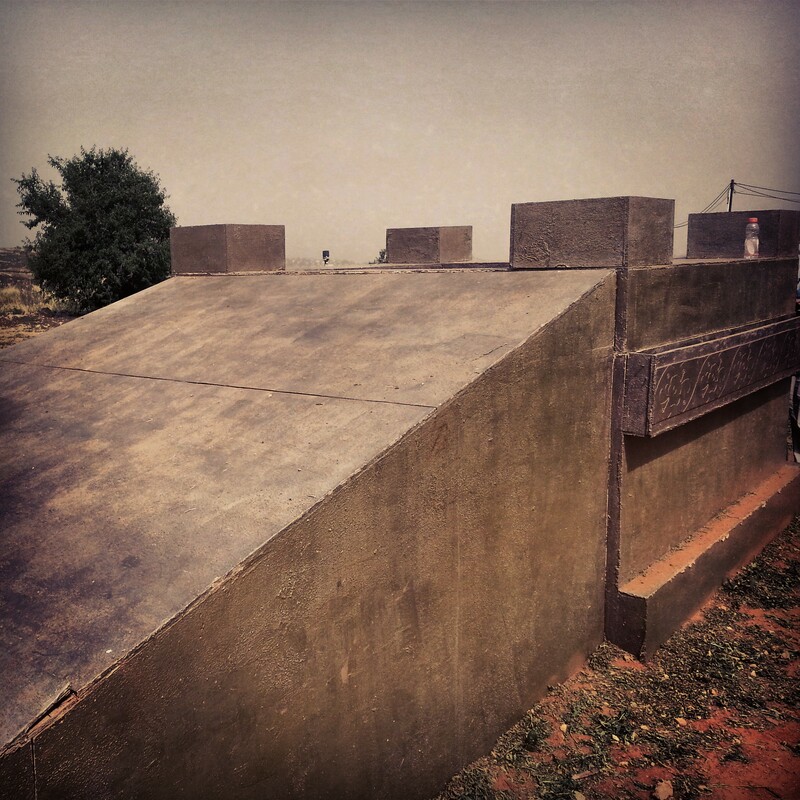 It is possible to relive the experience of being at the wall in the centuries before the state, and interestingly it is not separated between men and women unlike in the main plaza. 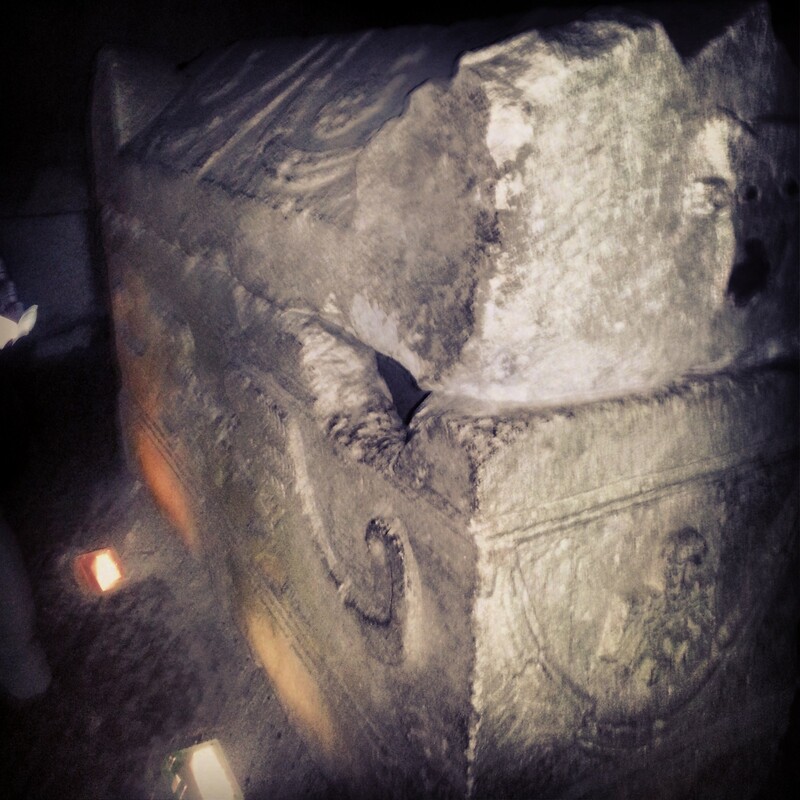 I had no idea it existed so it was a very interesting discovery; some Jews even say it is holier than the Western Wall which most people visit as it is closer to where the Holy of Holies would have been situated. We continued wandering the streets of the Muslim Quarter, witnessing more examples of Mamluk architecture such as the alternating light and dark style of the ablaq masonry, before the day drew to a close.